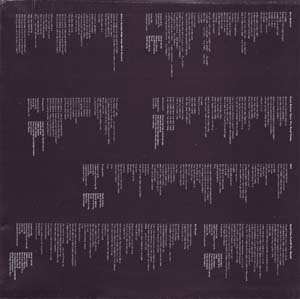 A-Matrix: "510347-1 1 01 P 1991"
B-Matrix: "510347-1 2 01 P 1991"
A-Matrix: "​020 212110 A-1 (U2 8-A-9) AA 314-510-347-1-AS-SP2 1-1 SM1-2"
B-Matrix: "020 21211—1 B-1 212110 B-2 (U2 8-B-10) AA 314-510-347-BS-SP3 1-1"
A-Matrix: "020 212110 A-1 II (U2 8-A-9) 314-510-347-1-AS-SP2 1-1 SM1-2​"
B-Matrix: "020 212110-B-1 II (U2 8-B-9) 314-510-347-1-BS-SP2# 11 SM1-1​"
A-Matrix: "U28-A-7 212110 A-4 08-31522-20 1A1"
B-Matrix: "212110B-4 U2 8-B-1 08-31522-20 1B1"
A-Matrix: "530 303-9 -A1- -LVC- 68685 1A"
B-Matrix: "530 303-9 -b1- -LVC- 68685 1B"
A-Matrix: "U2 8-A -6 1 212110IBER-A-1 AA"
B-Matrix: "​212110-IBER-B-1 (U2 8-B-9)314-510-347-1-BS-SP2 AA 1-1 SM1-3"
A-Matrix: "U2 8-A -6 1 212110IBER-A-1 AA​"
B-Matrix: "212110-IBER-B-1 (U2 8-B-9)314-510-347-1-BS-SP2 AA 1-1 SM1-3"
Page 1 of Insert: Double width insert folded in half with lyrics in English. 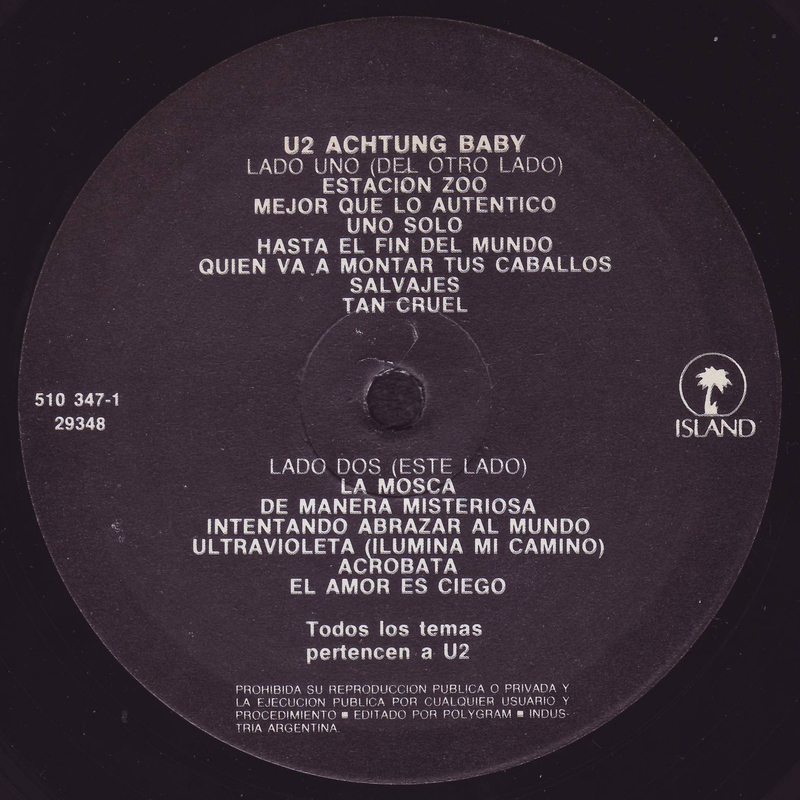 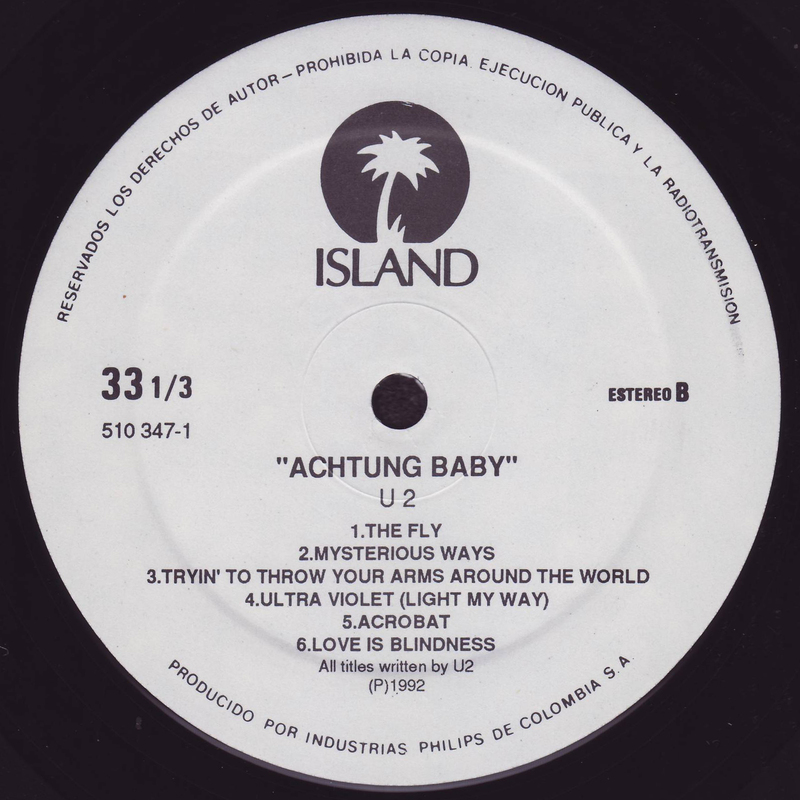 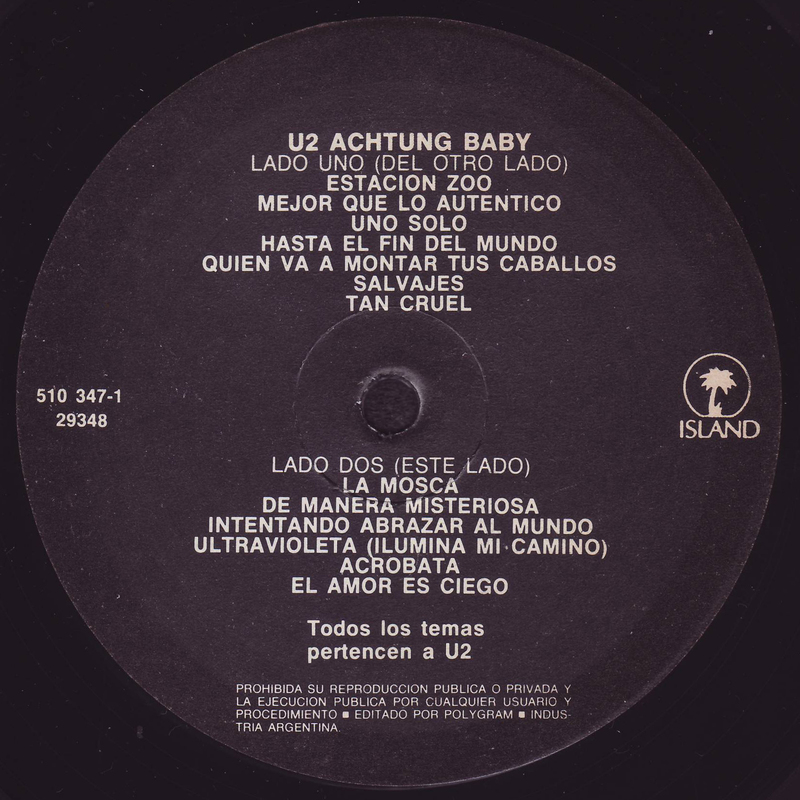 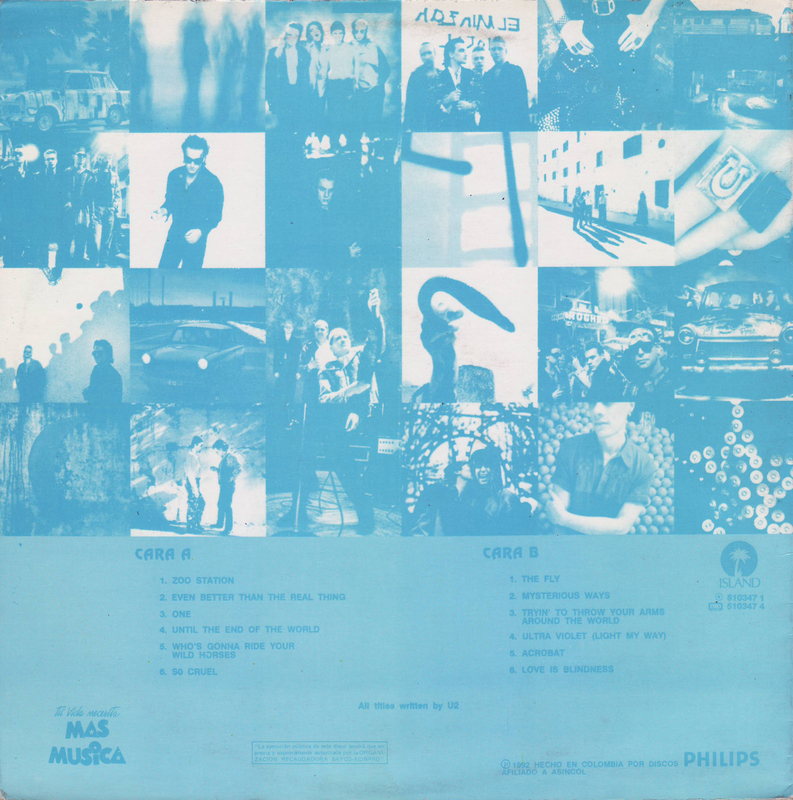 Page 2 of Insert: Double width insert folded in half with lyrics in Spanish. 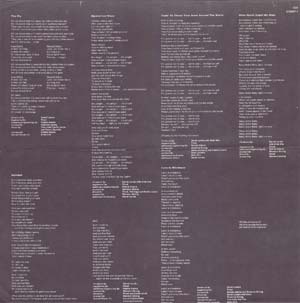 Page 3 of Insert: Double width insert folded in half with lyrics in Spanish. 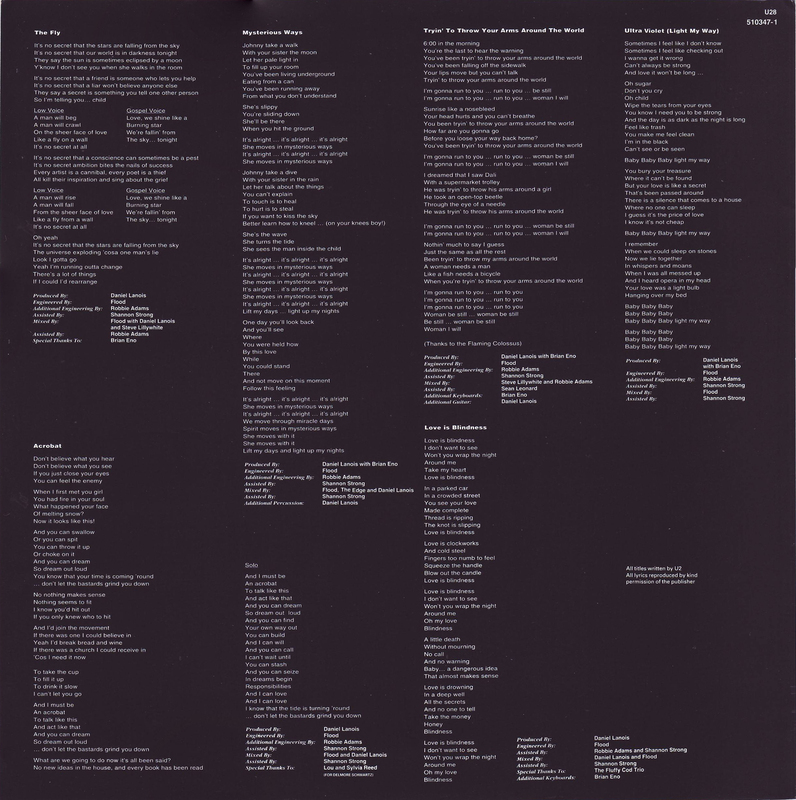 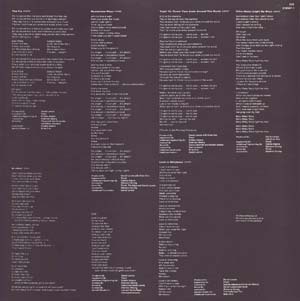 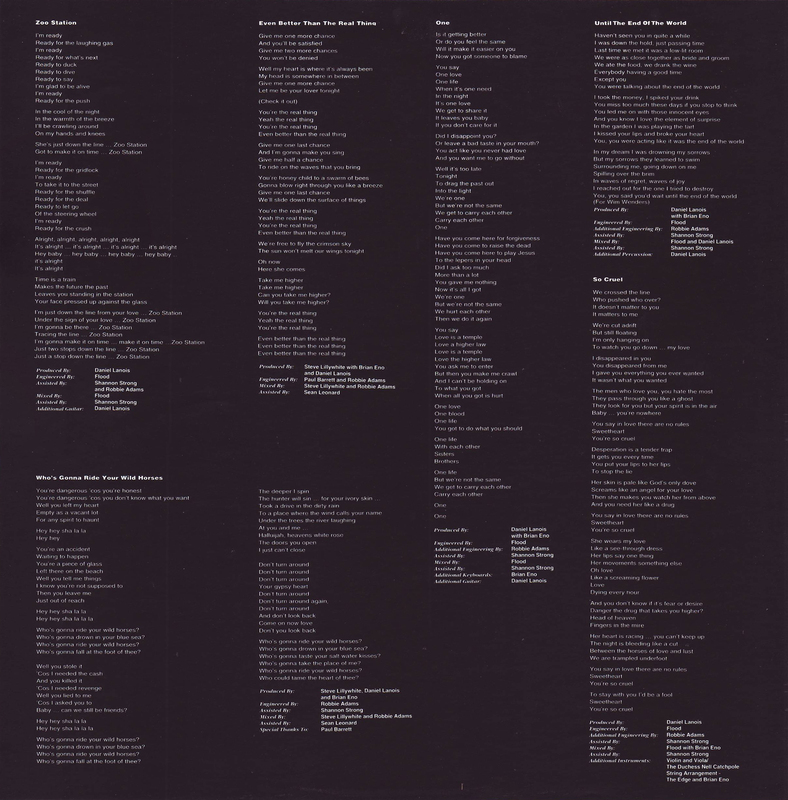 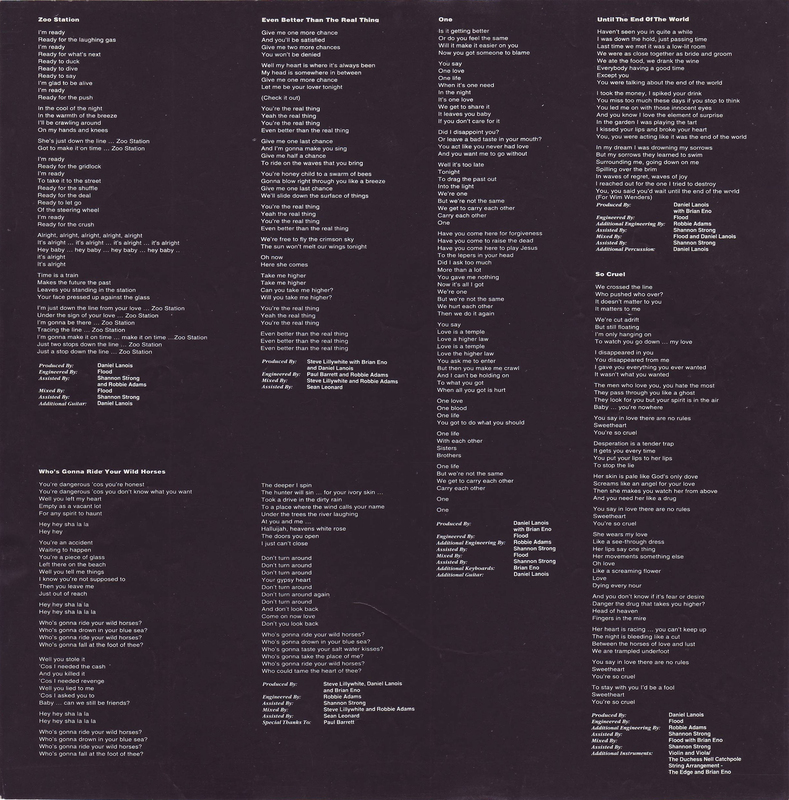 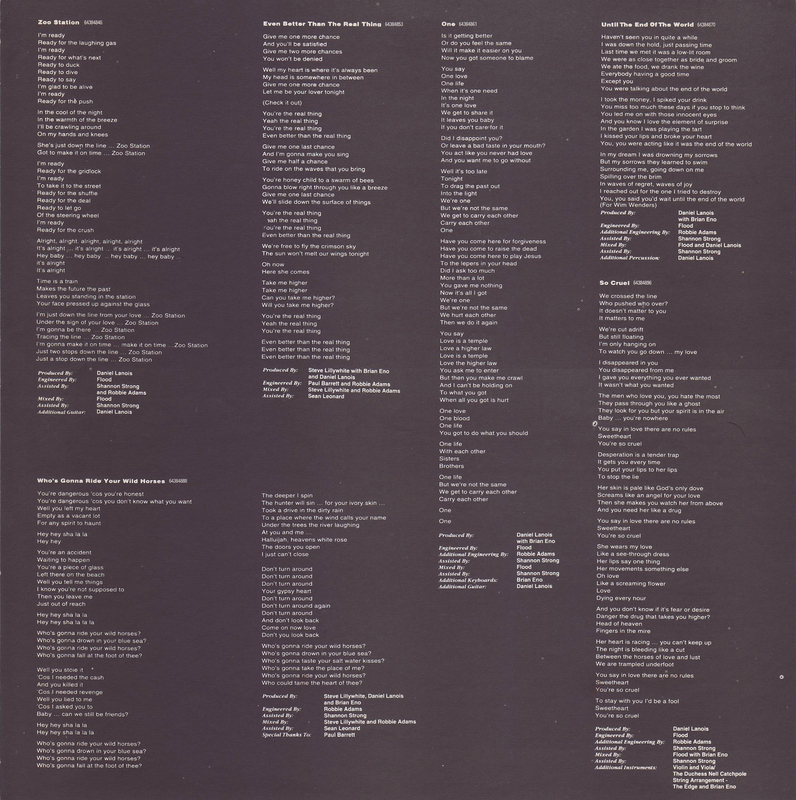 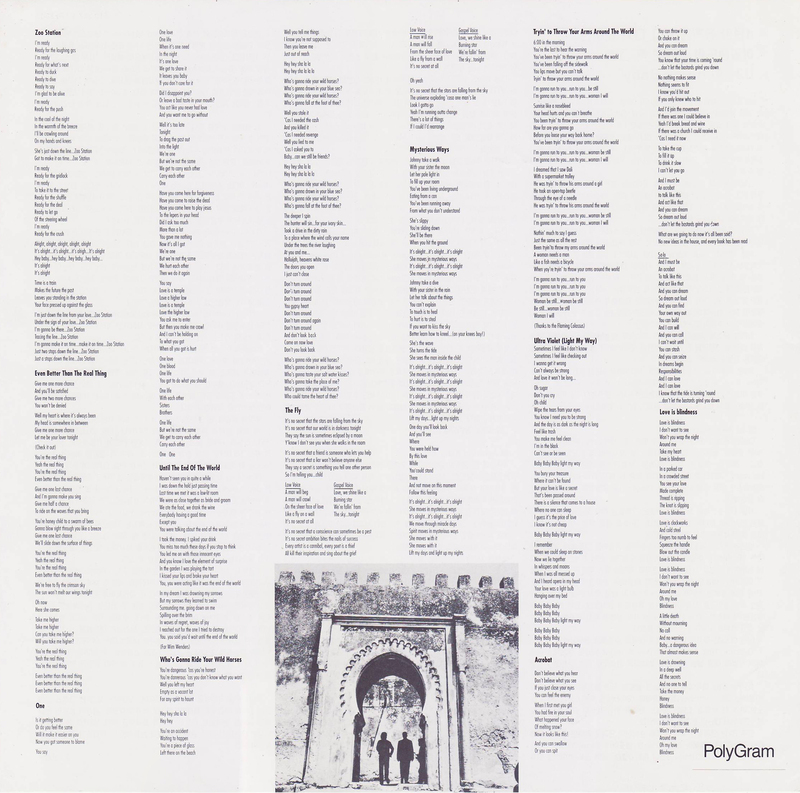 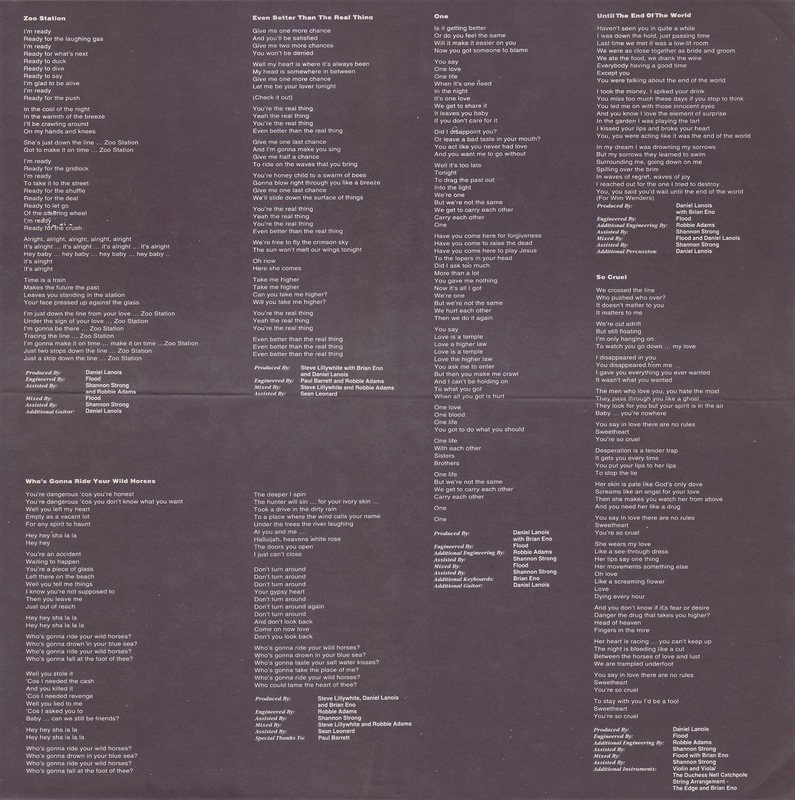 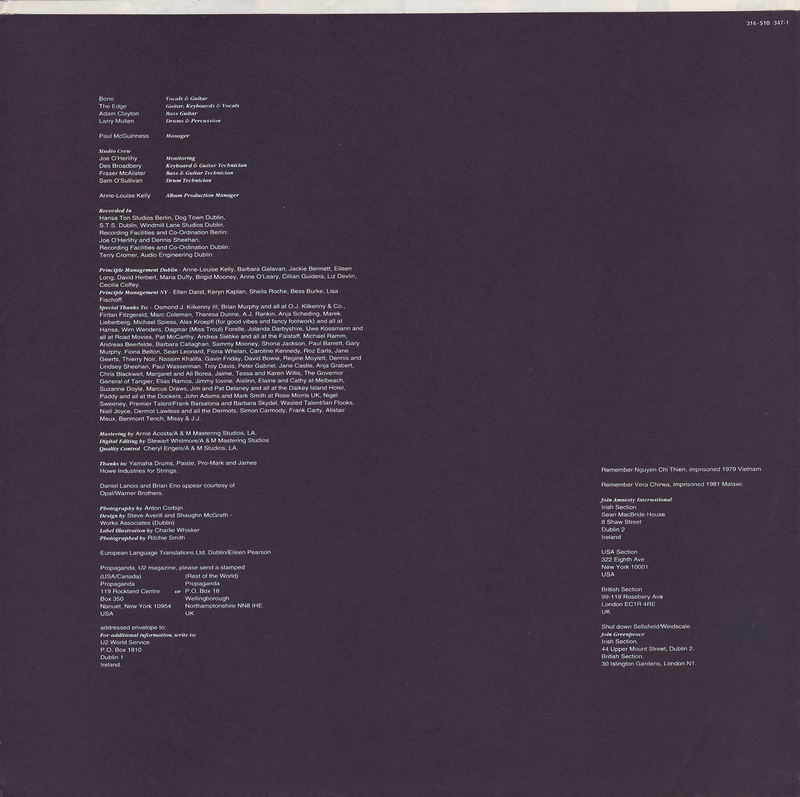 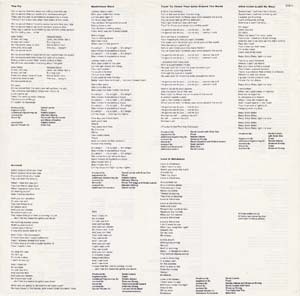 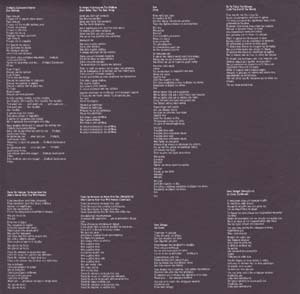 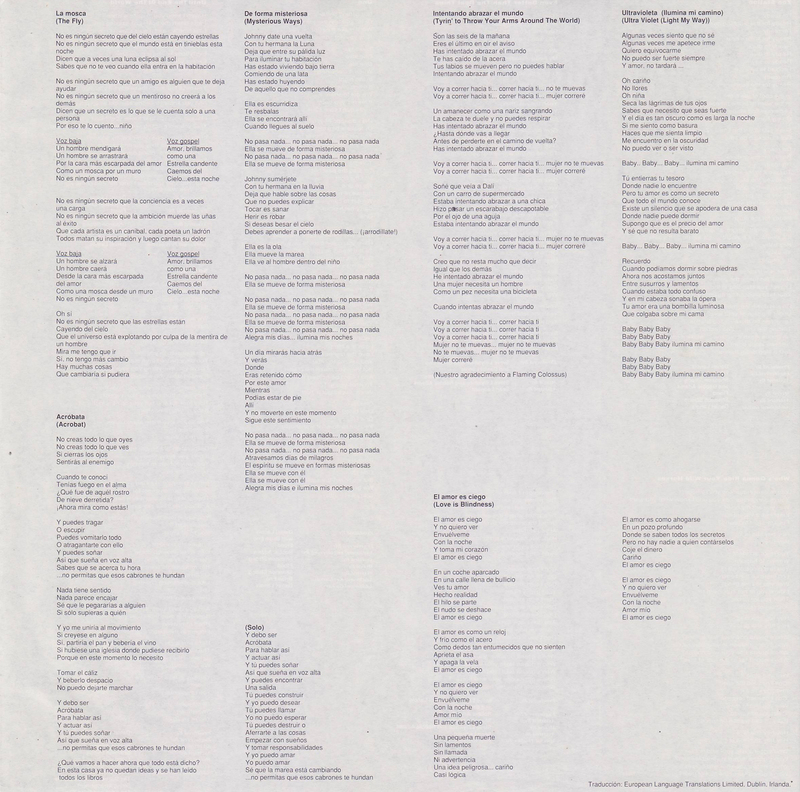 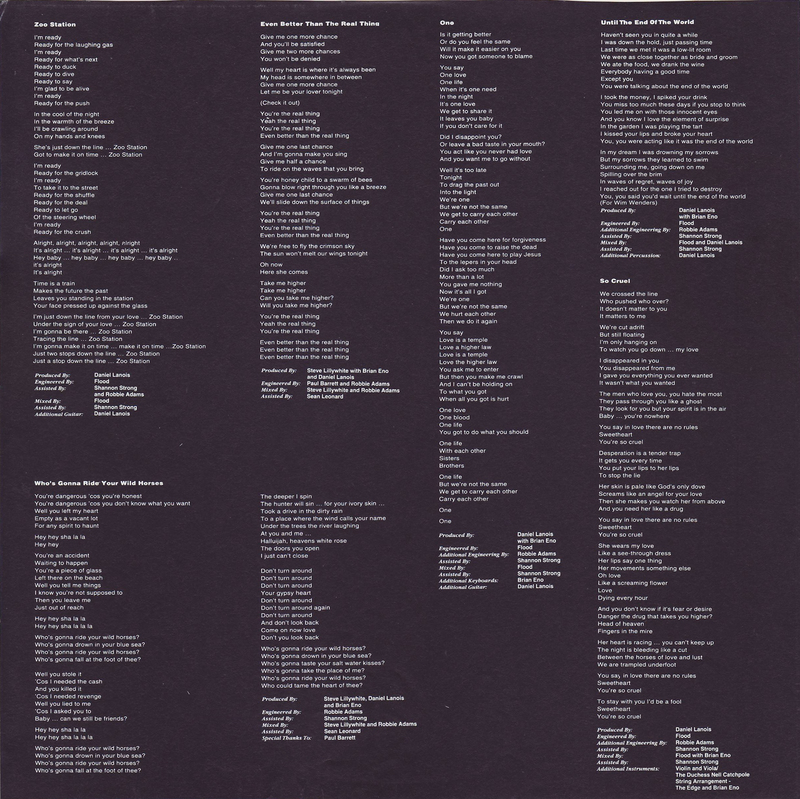 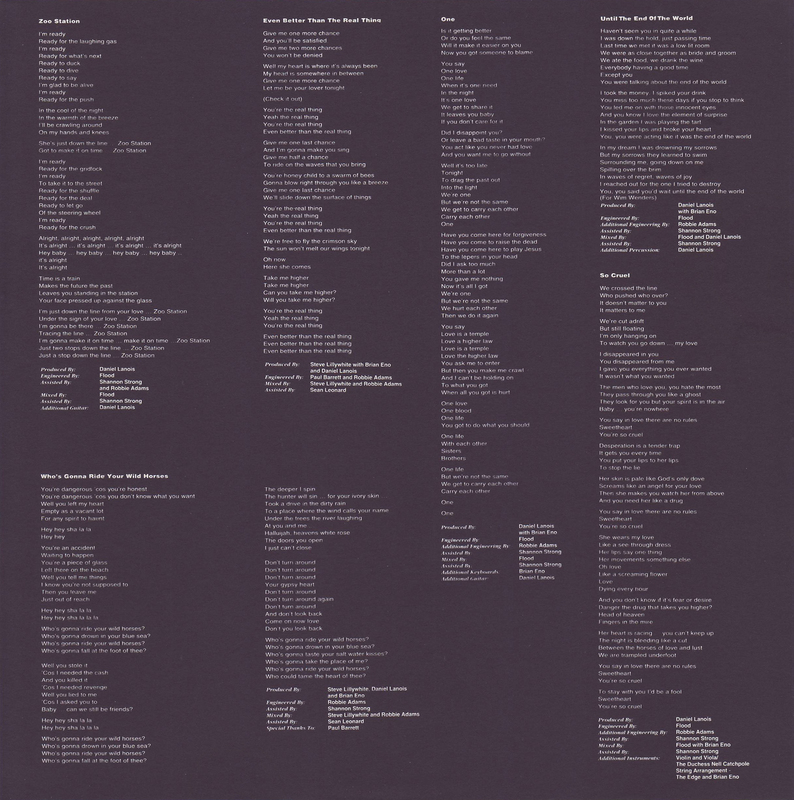 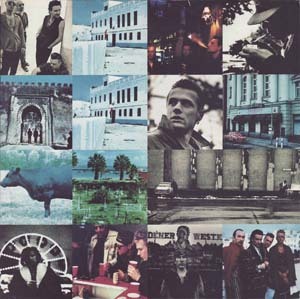 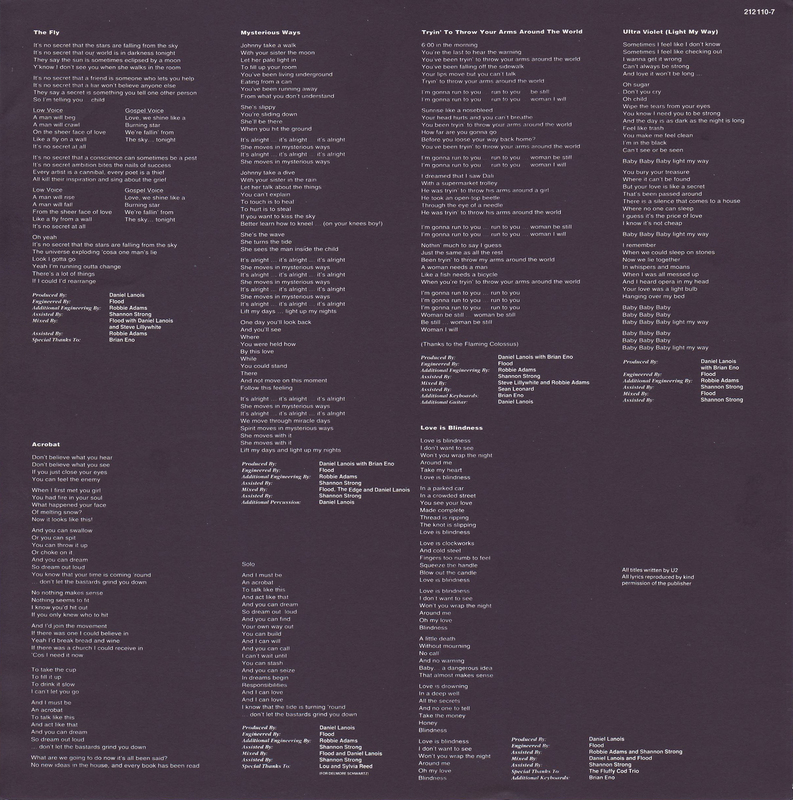 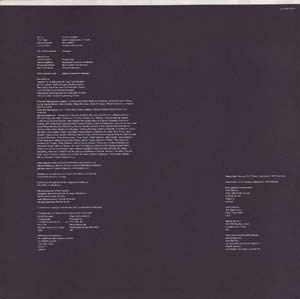 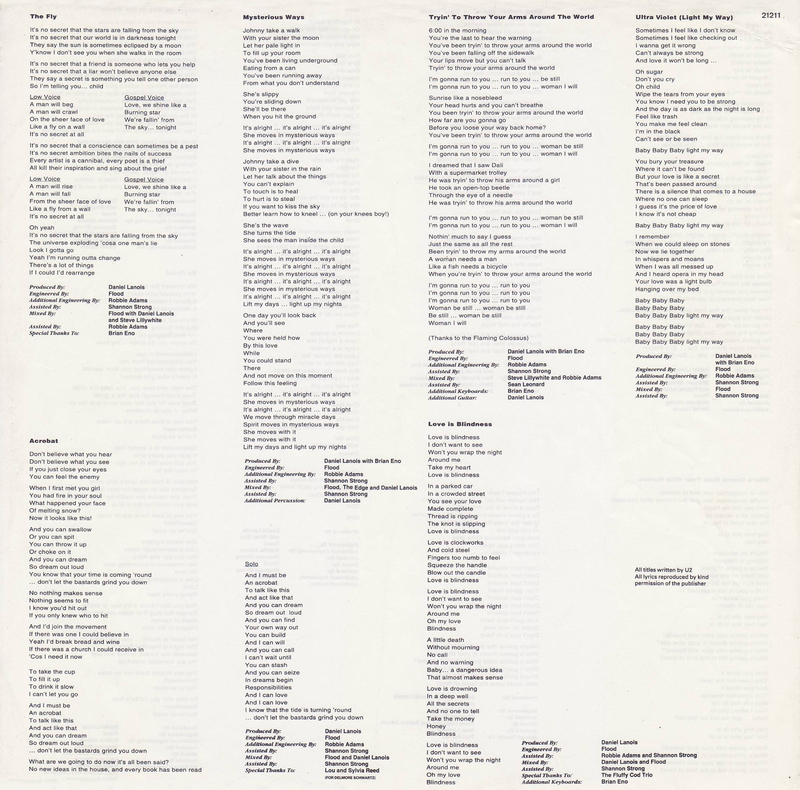 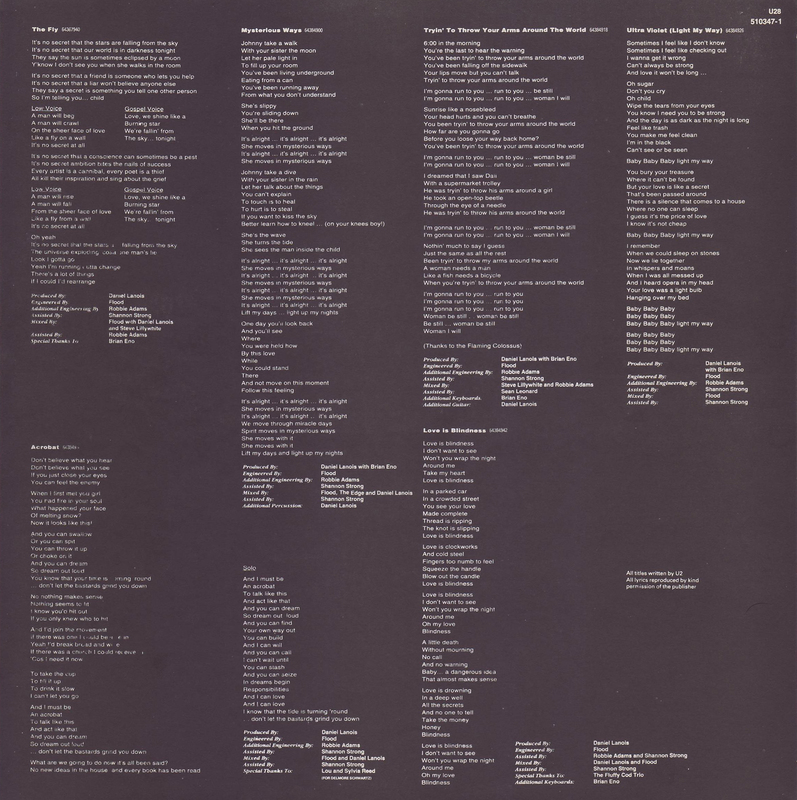 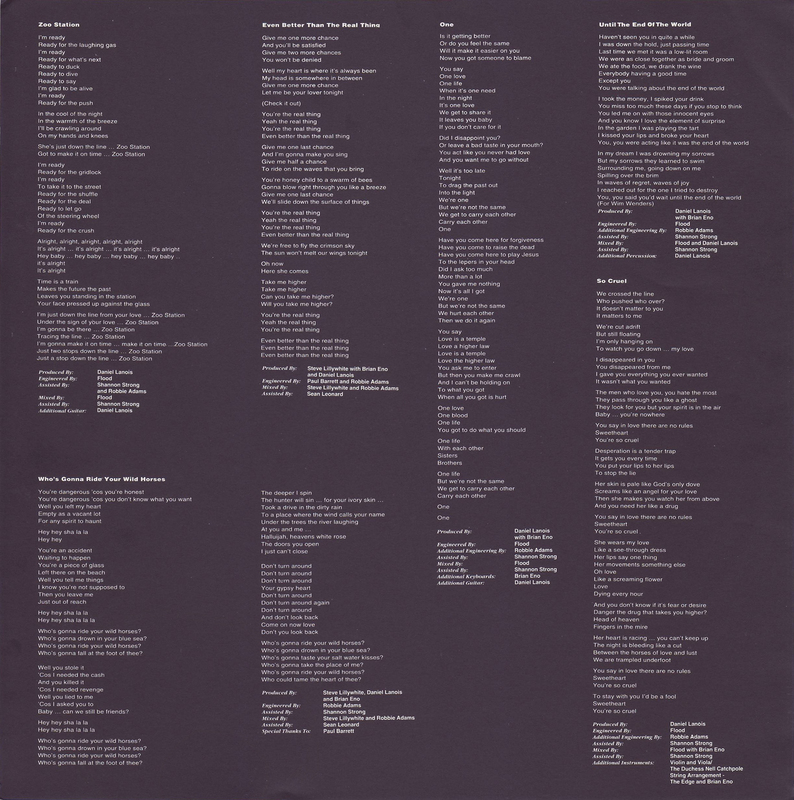 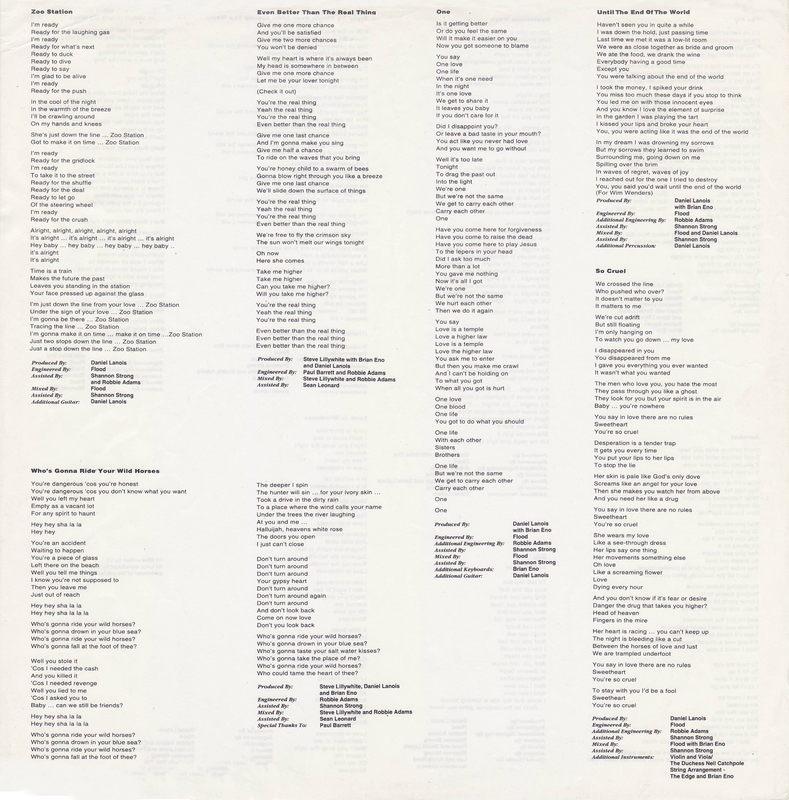 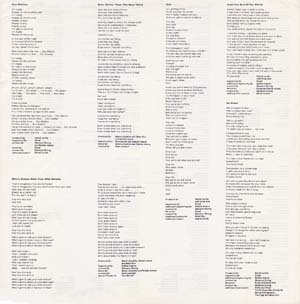 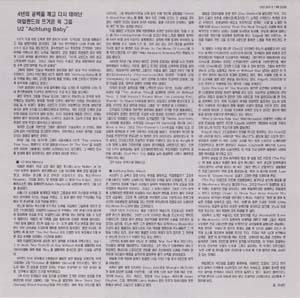 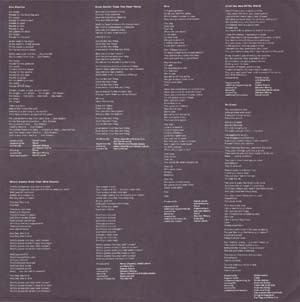 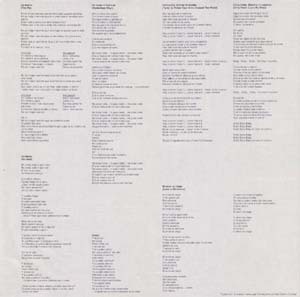 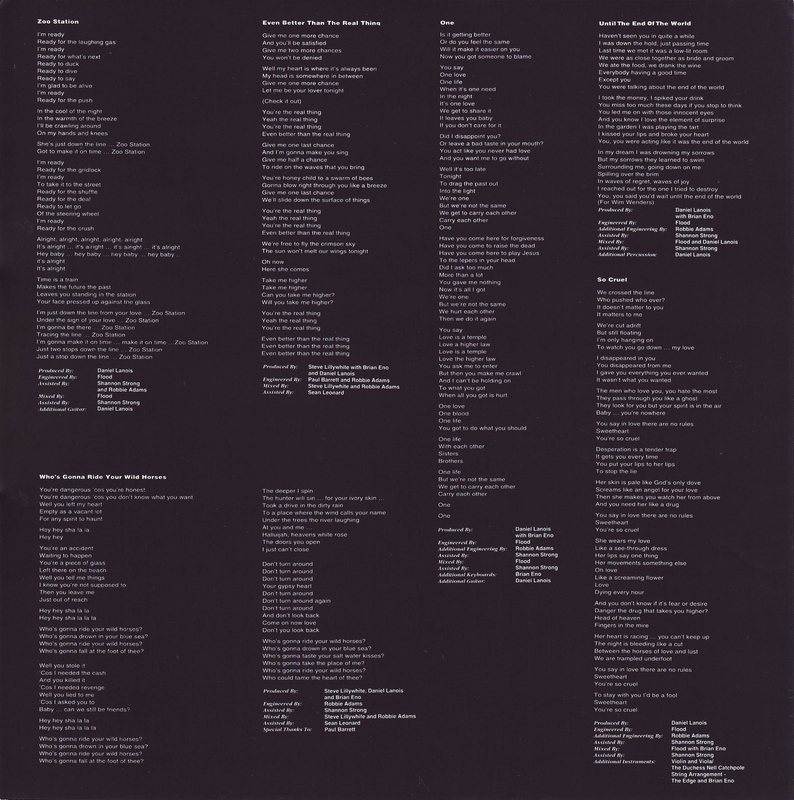 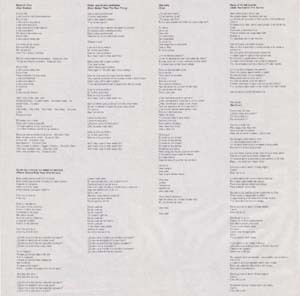 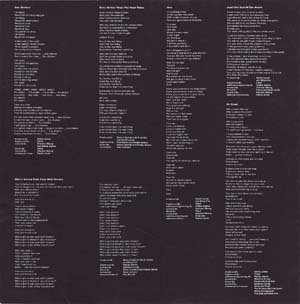 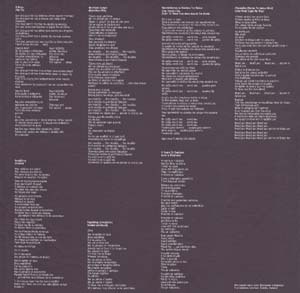 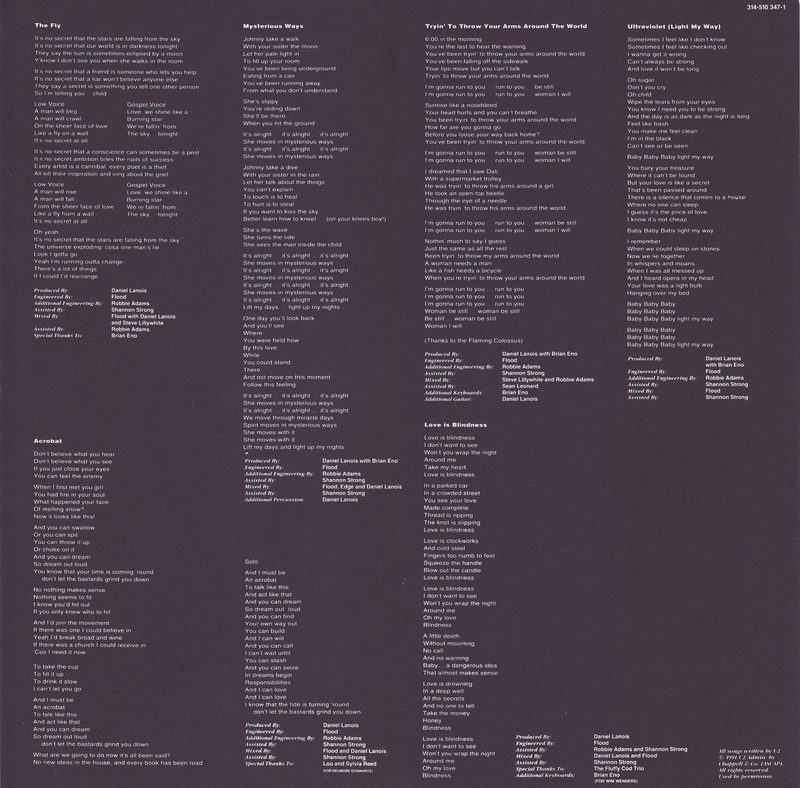 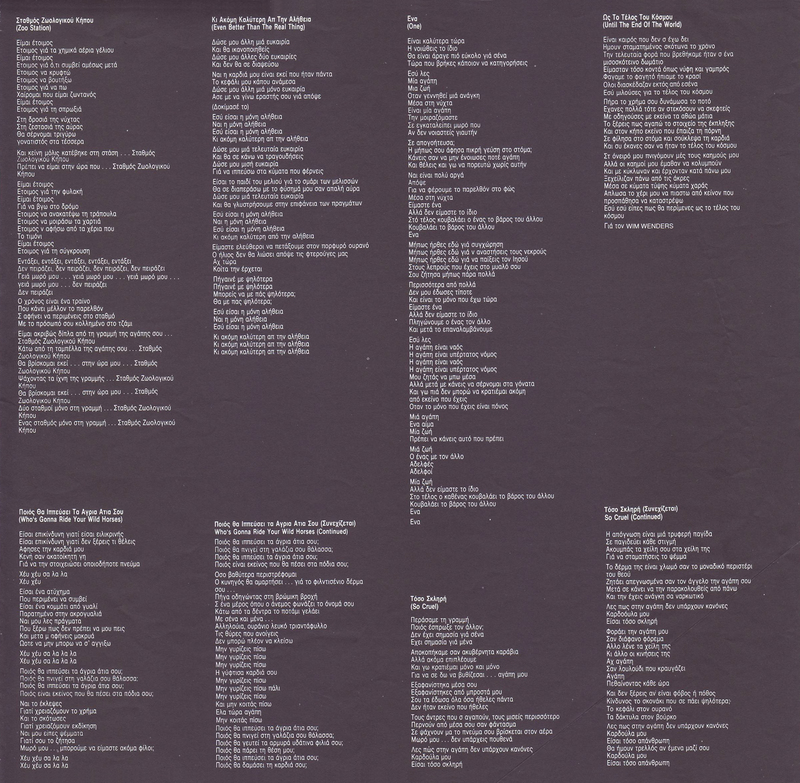 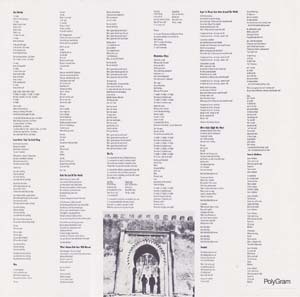 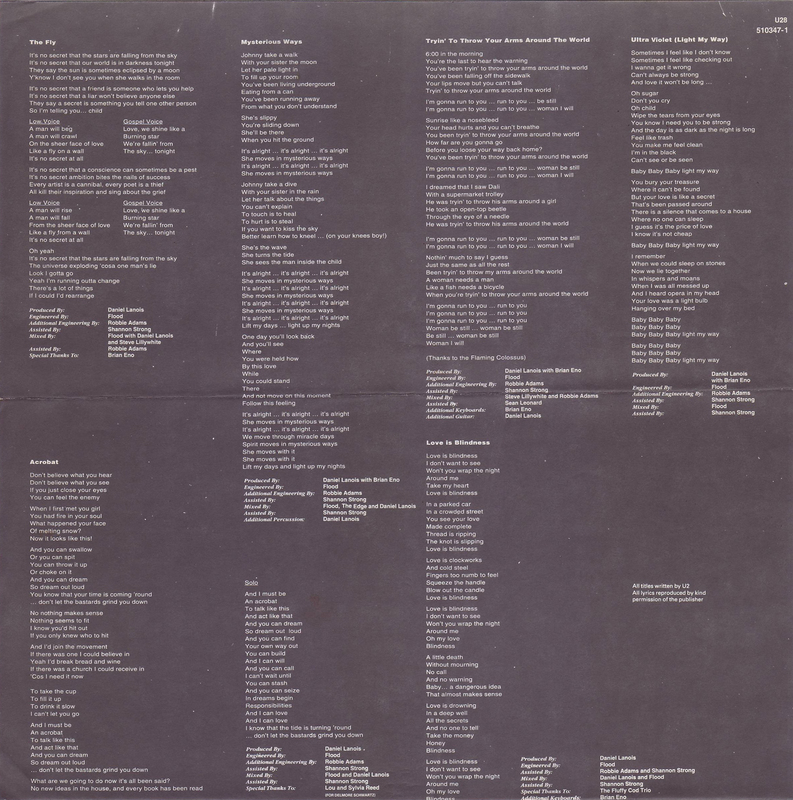 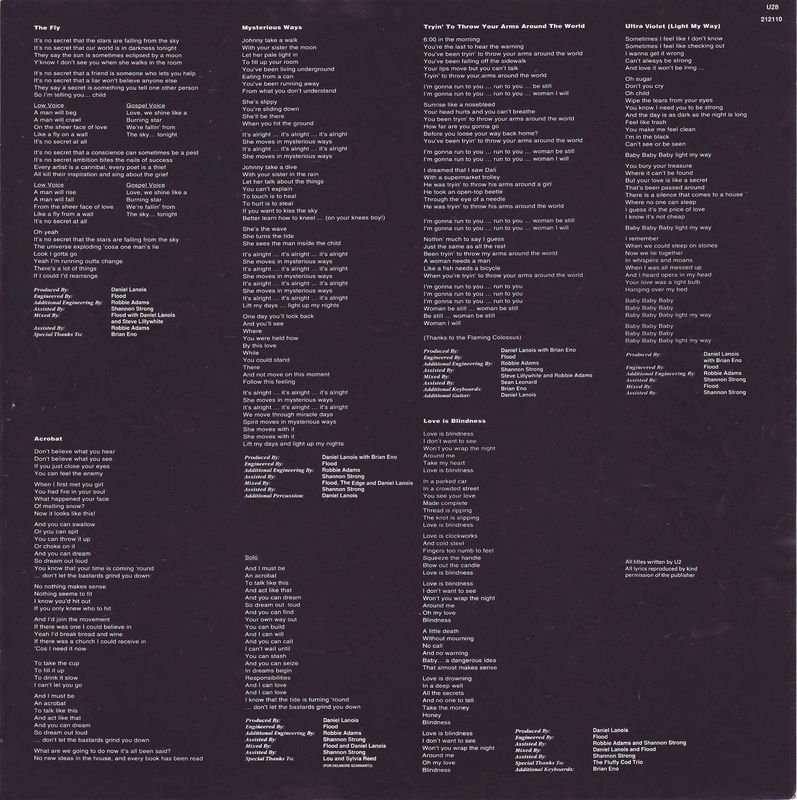 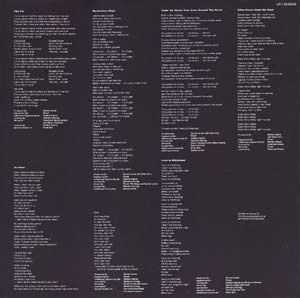 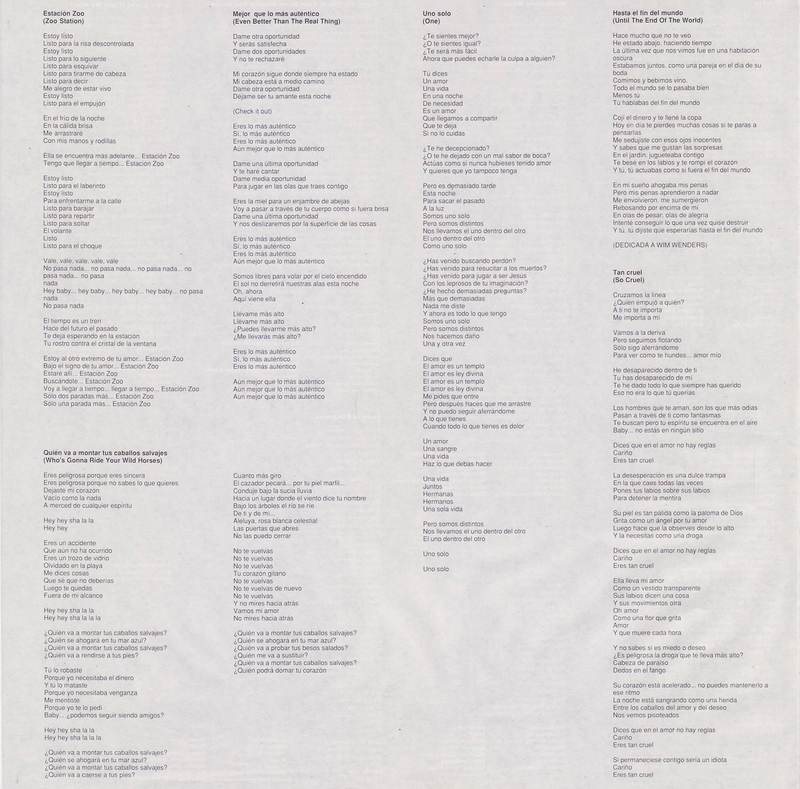 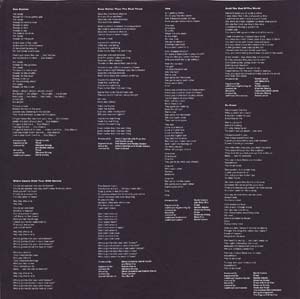 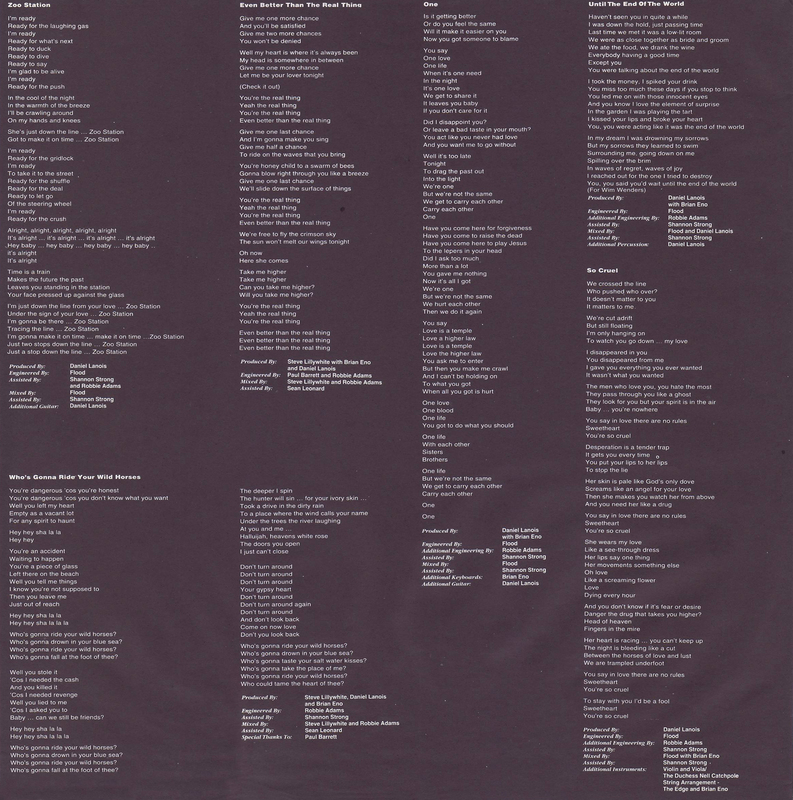 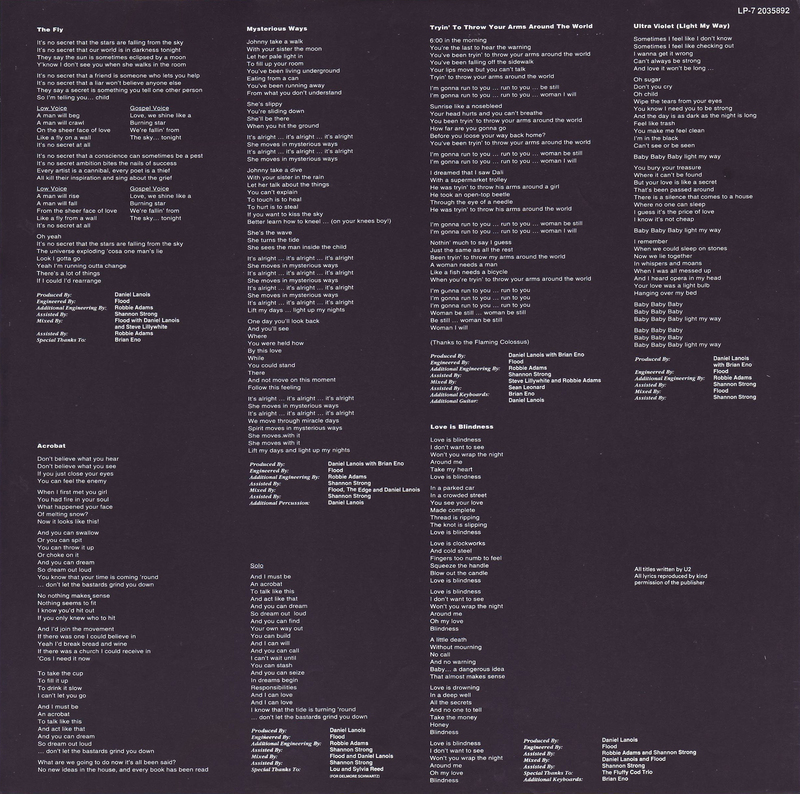 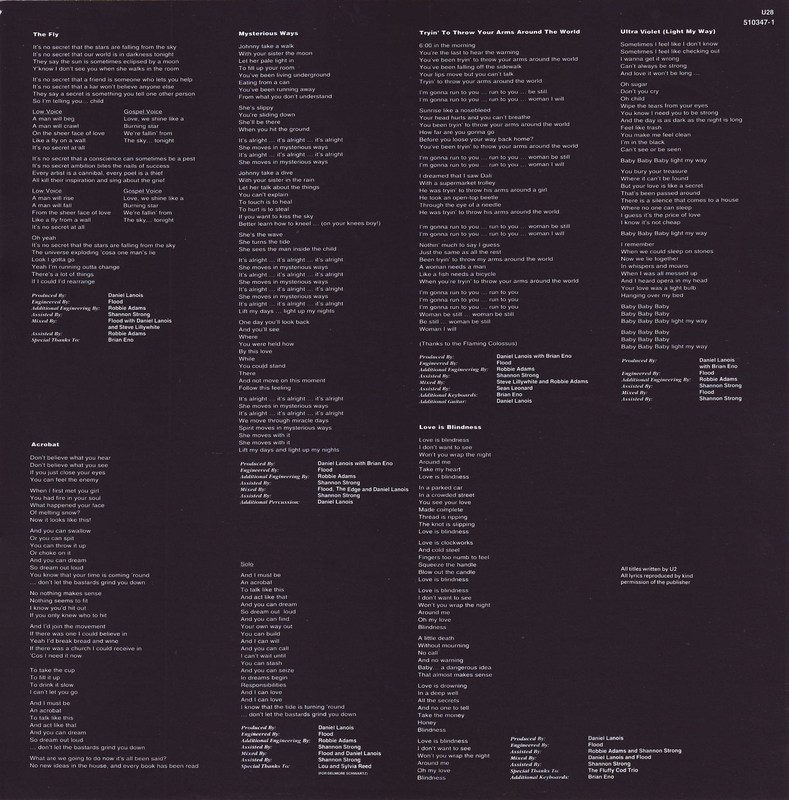 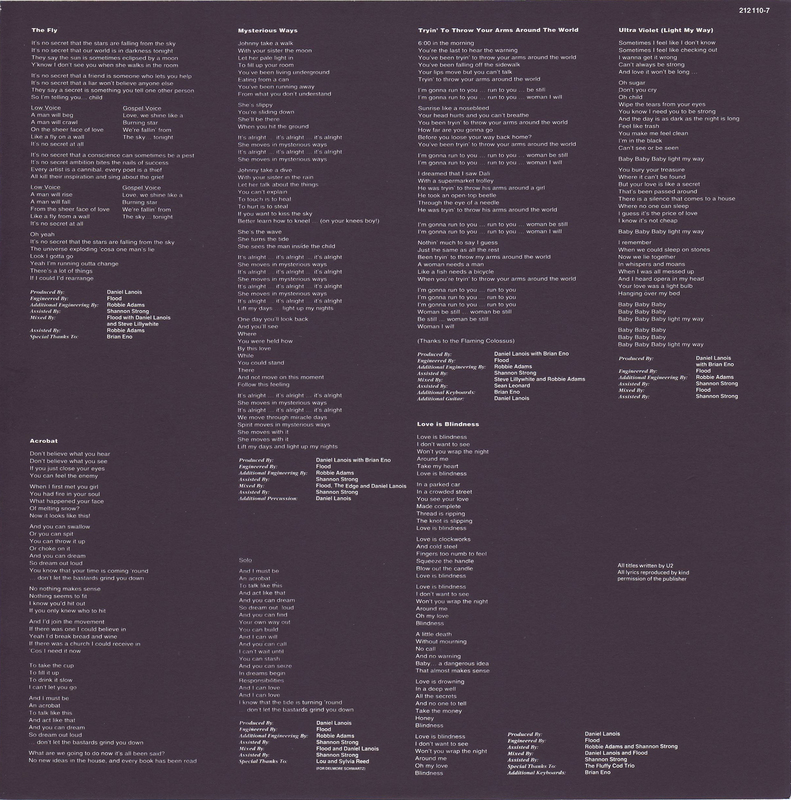 Page 4 of Insert: Double width insert folded in half with lyrics in English. 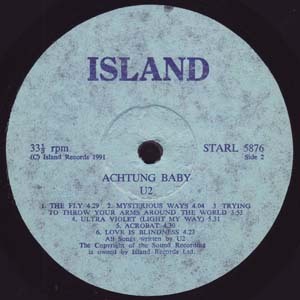 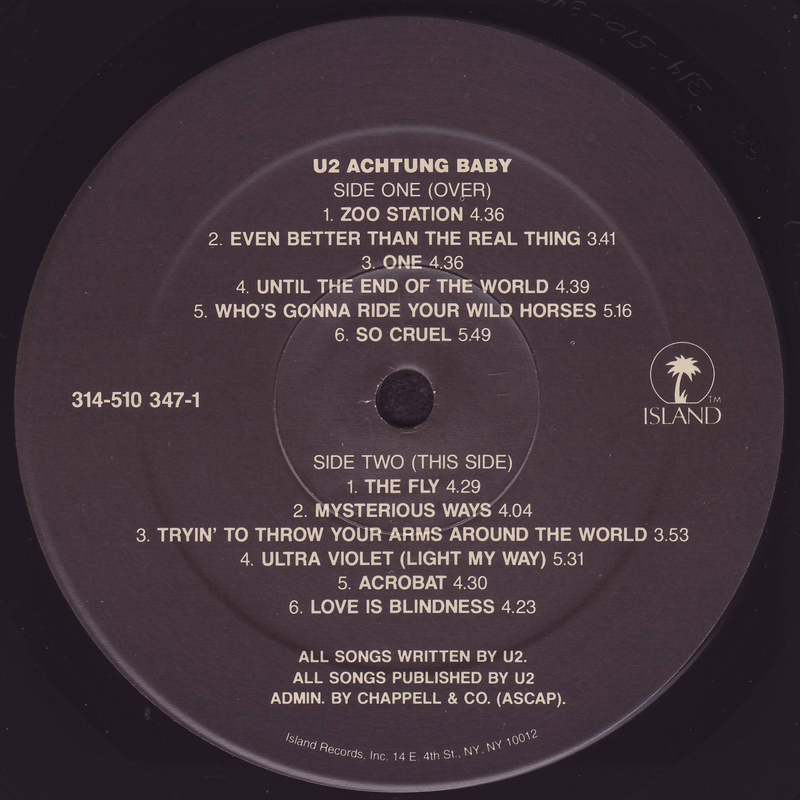 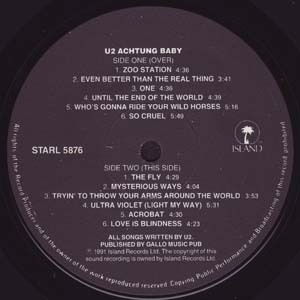 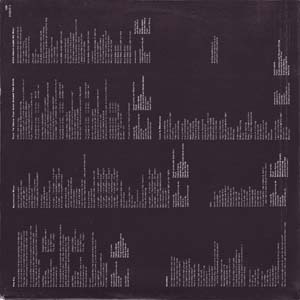 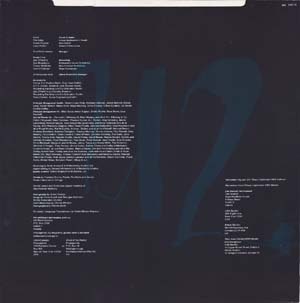 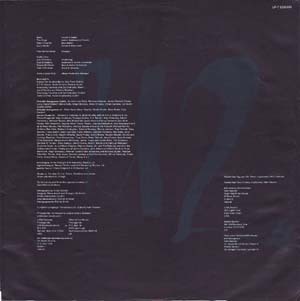 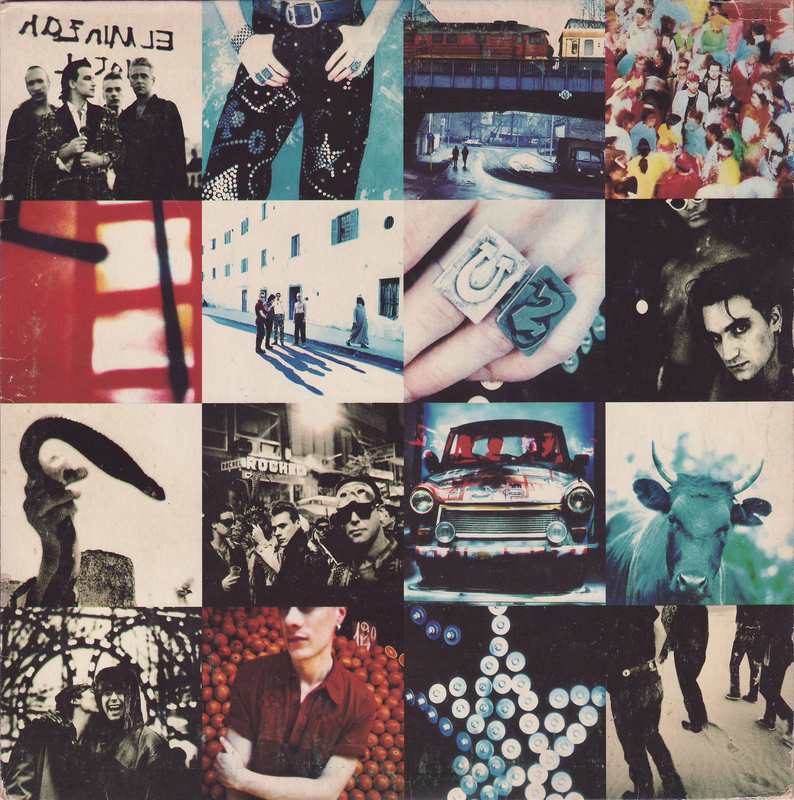 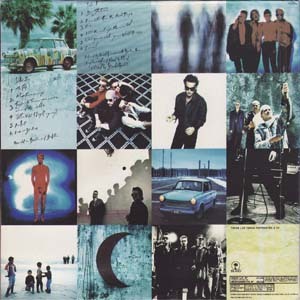 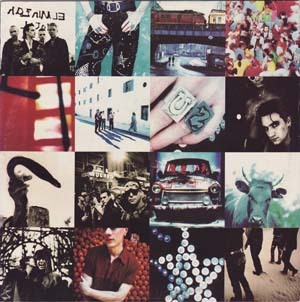 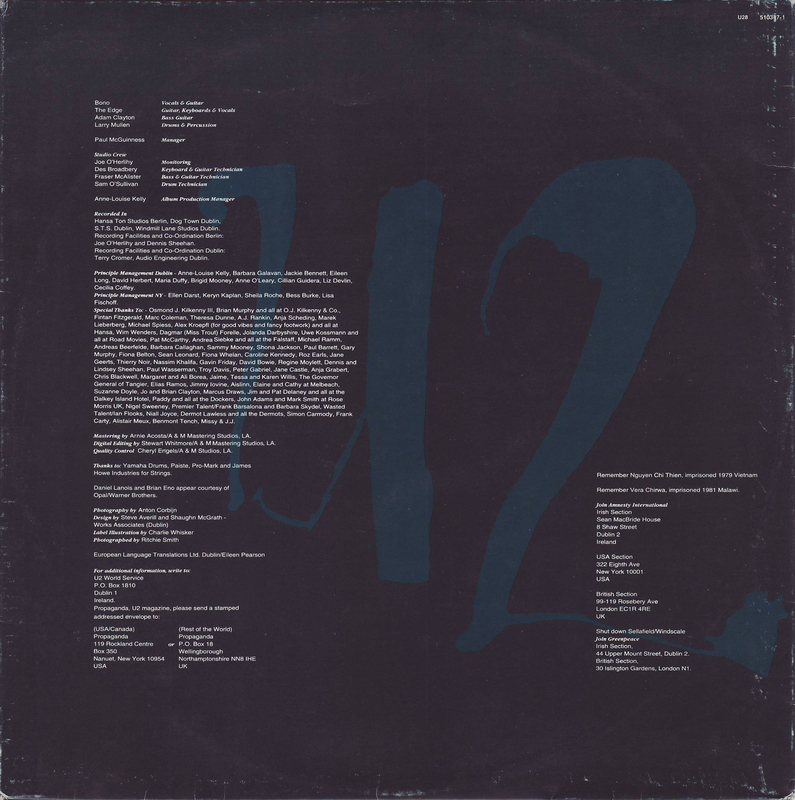 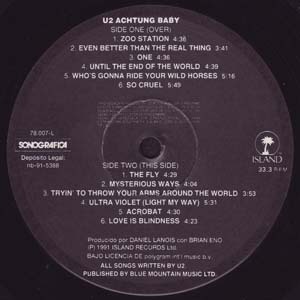 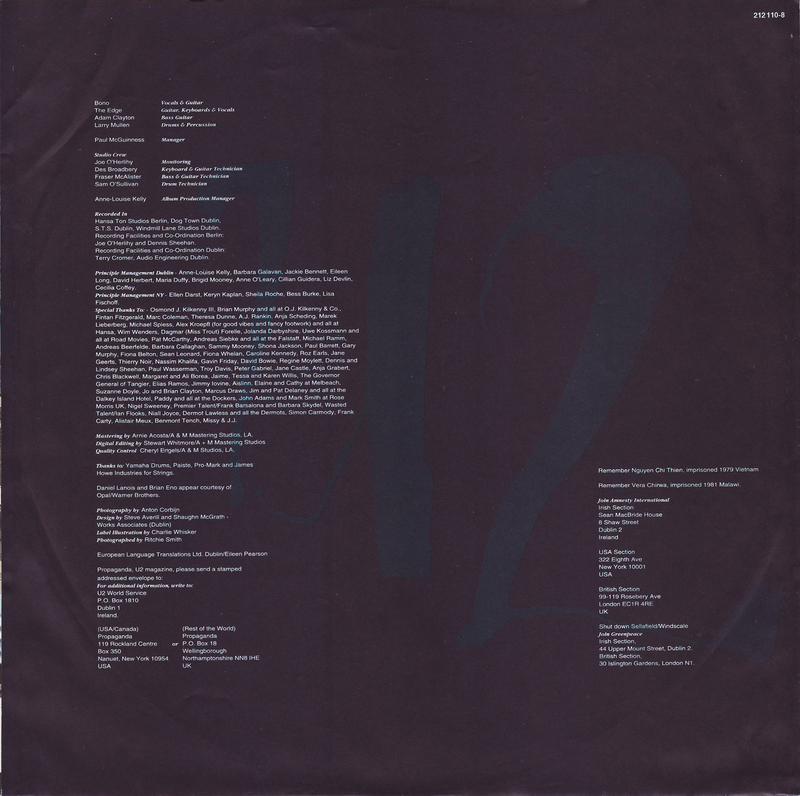 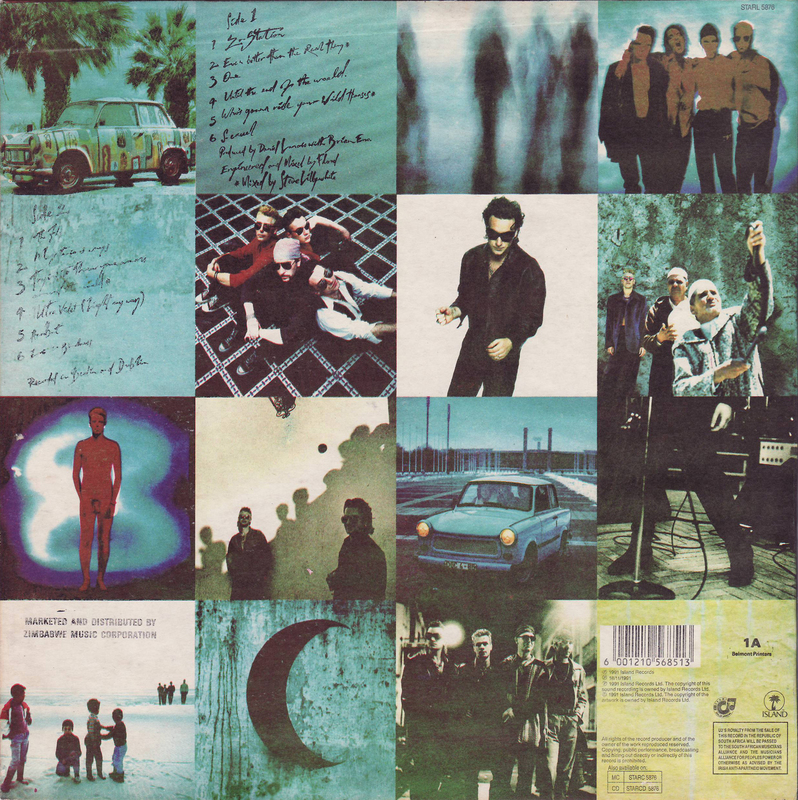 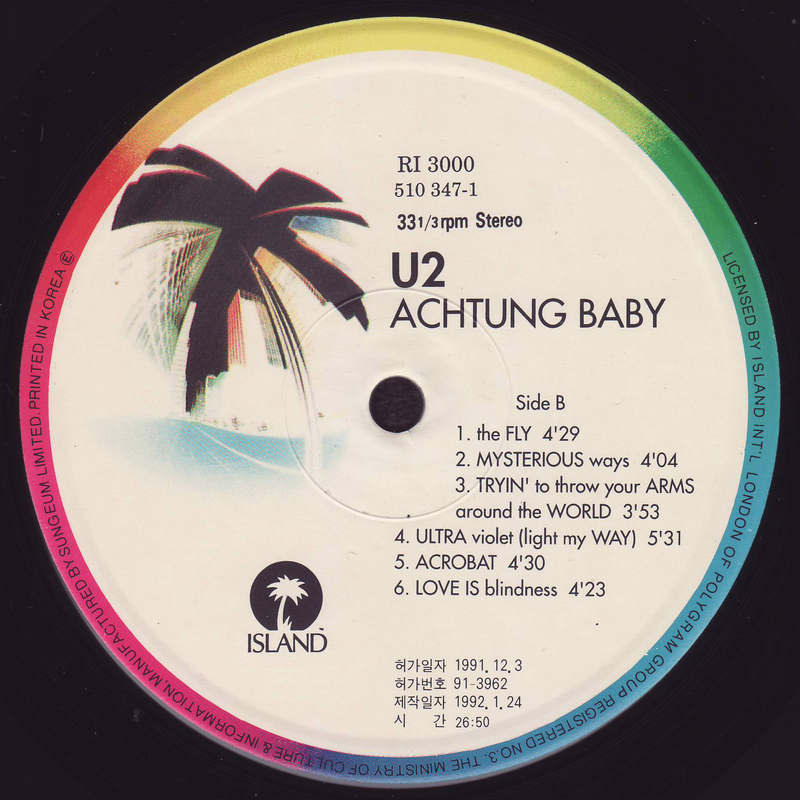 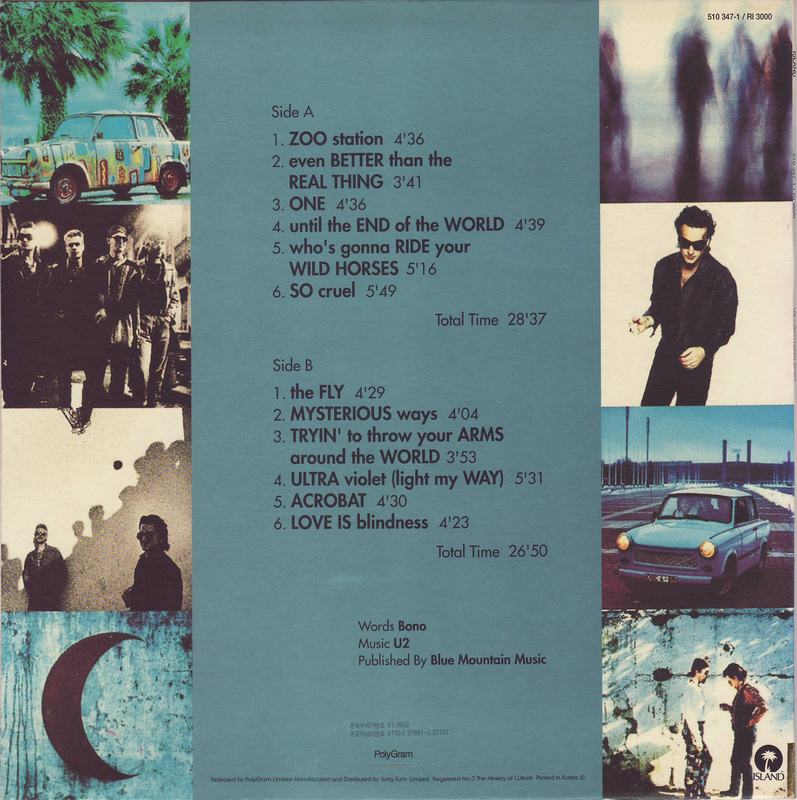 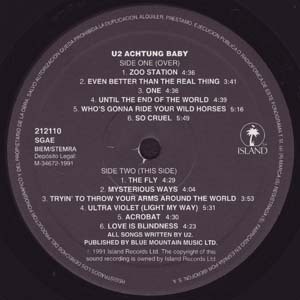 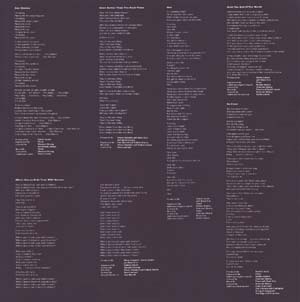 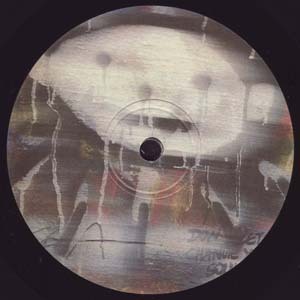 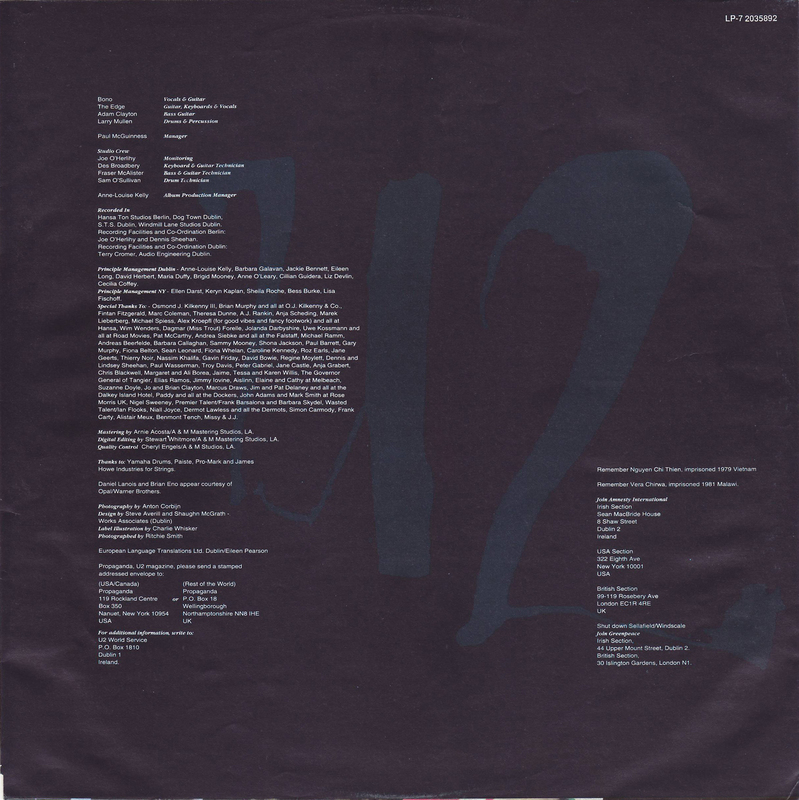 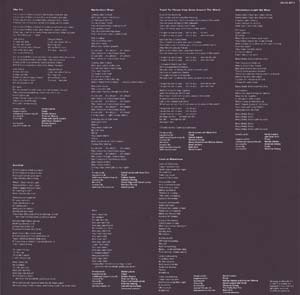 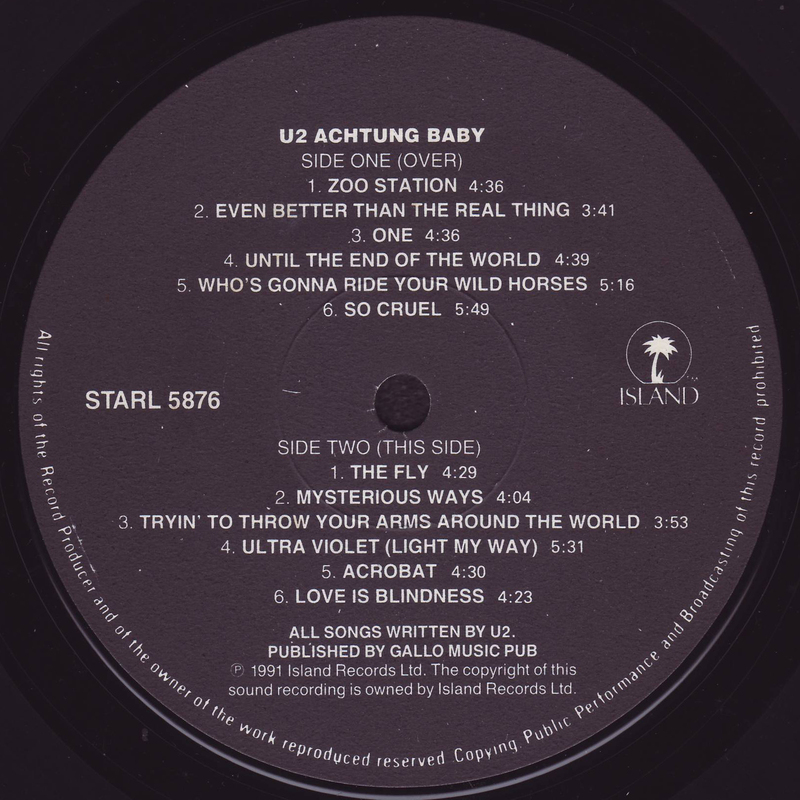 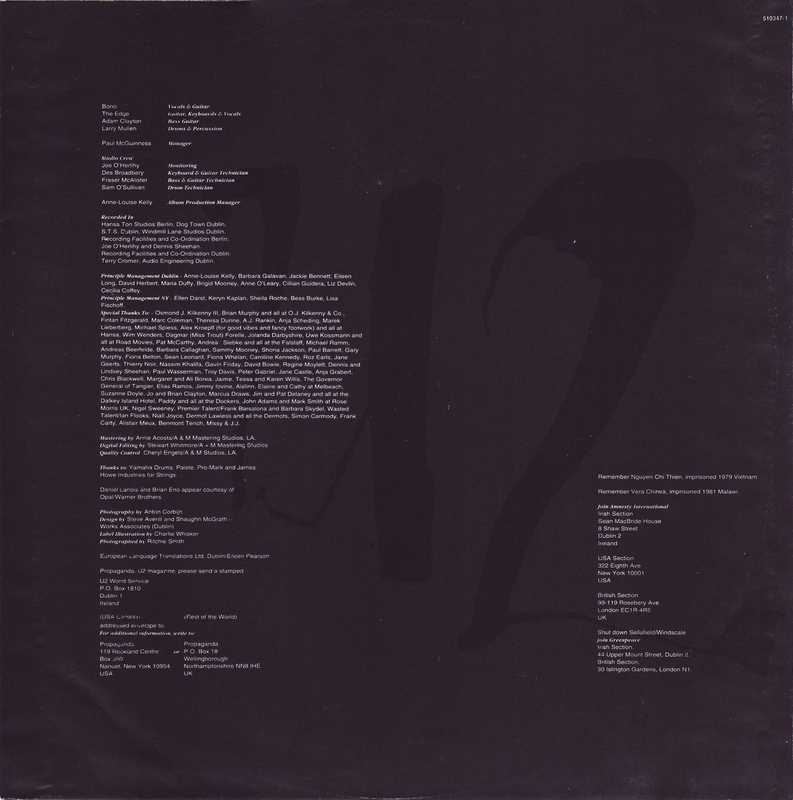 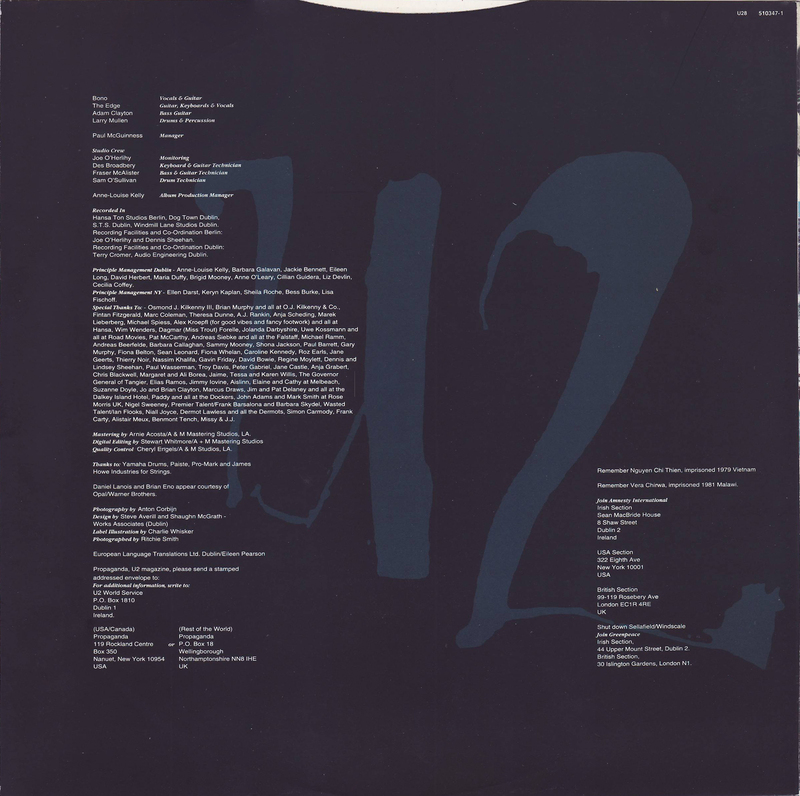 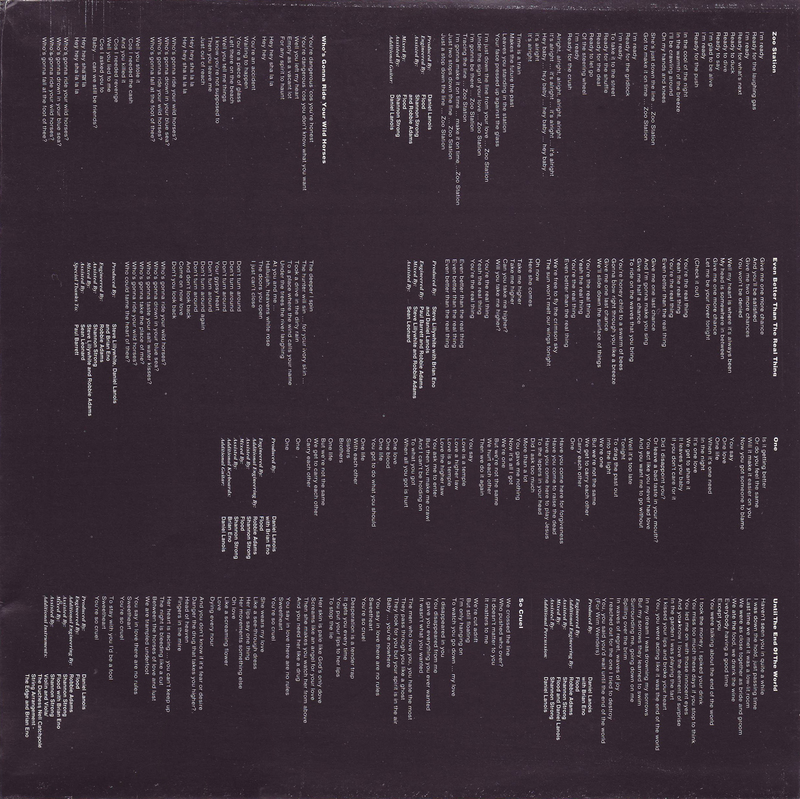 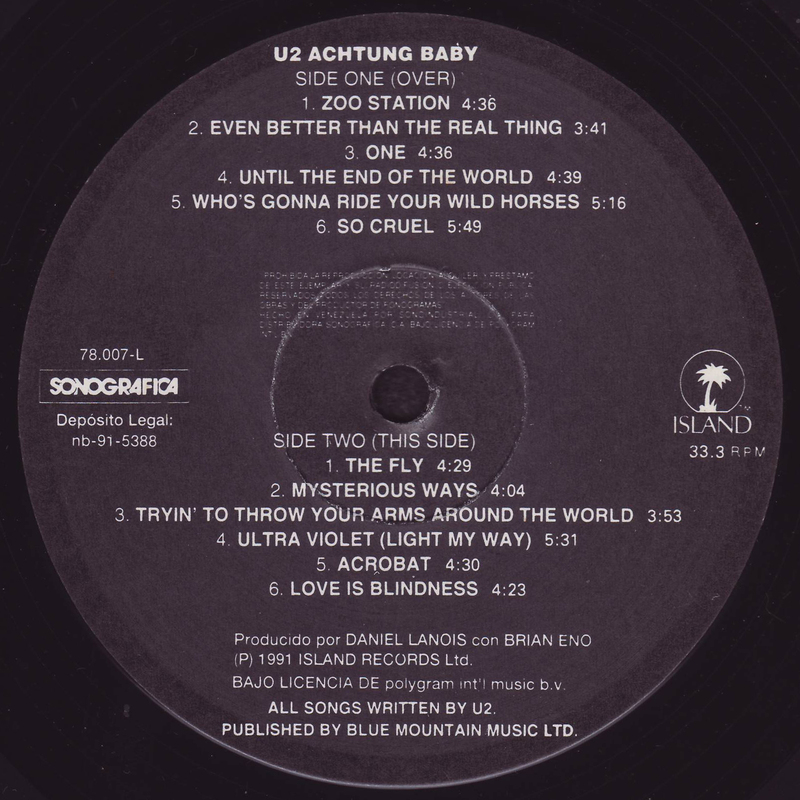 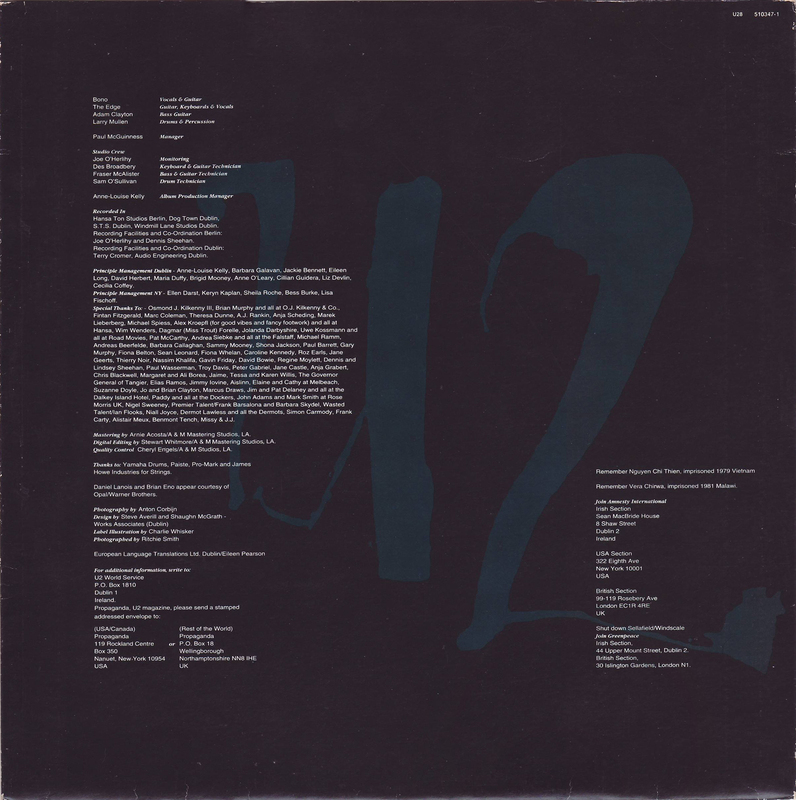 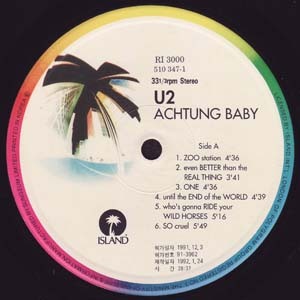 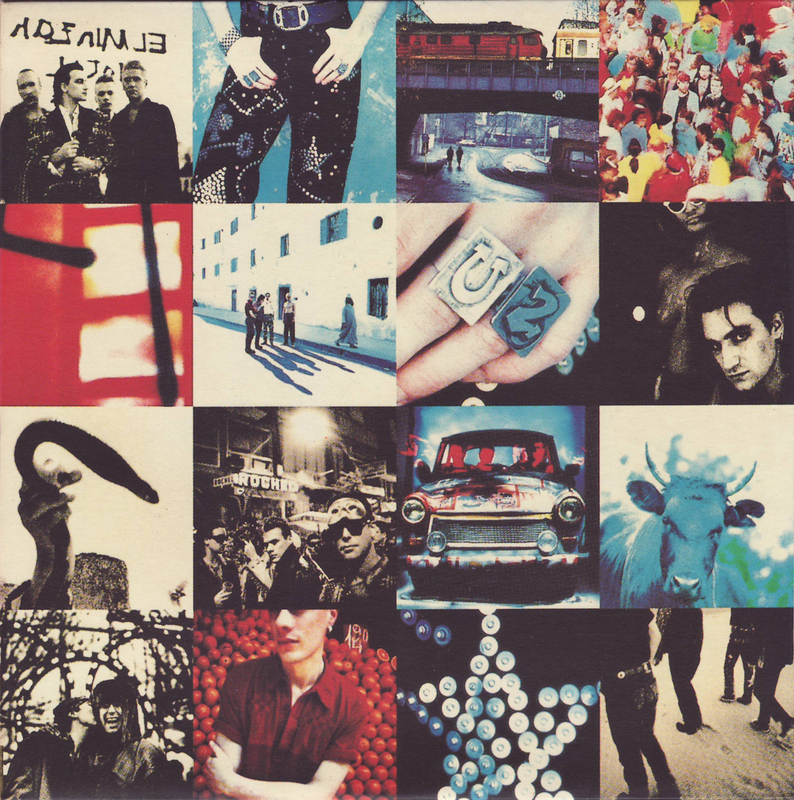 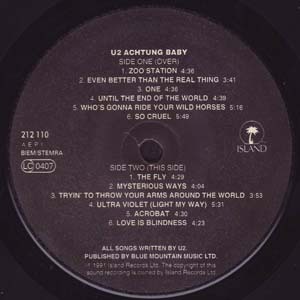 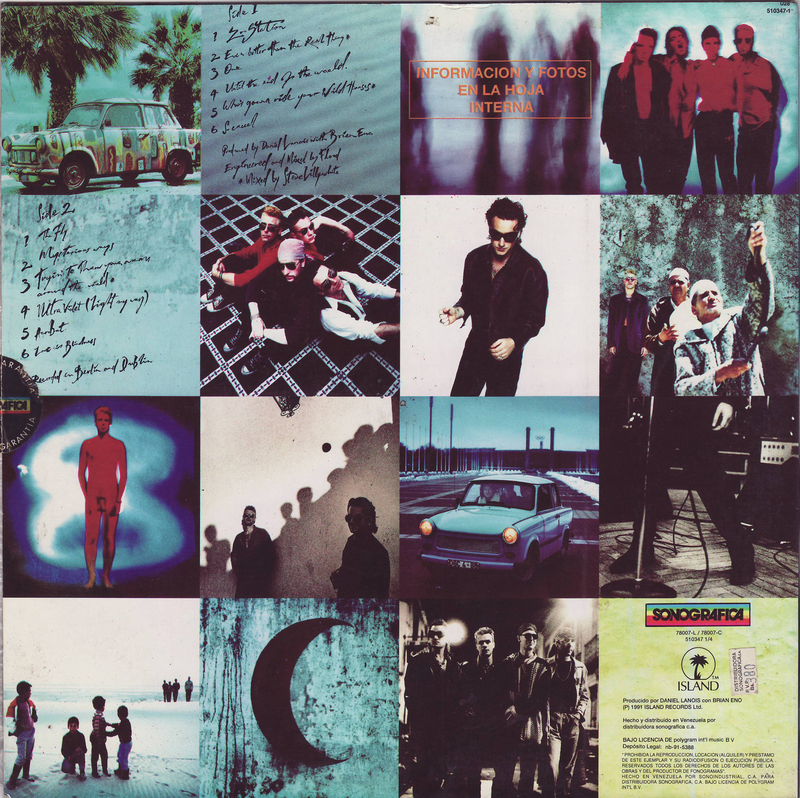 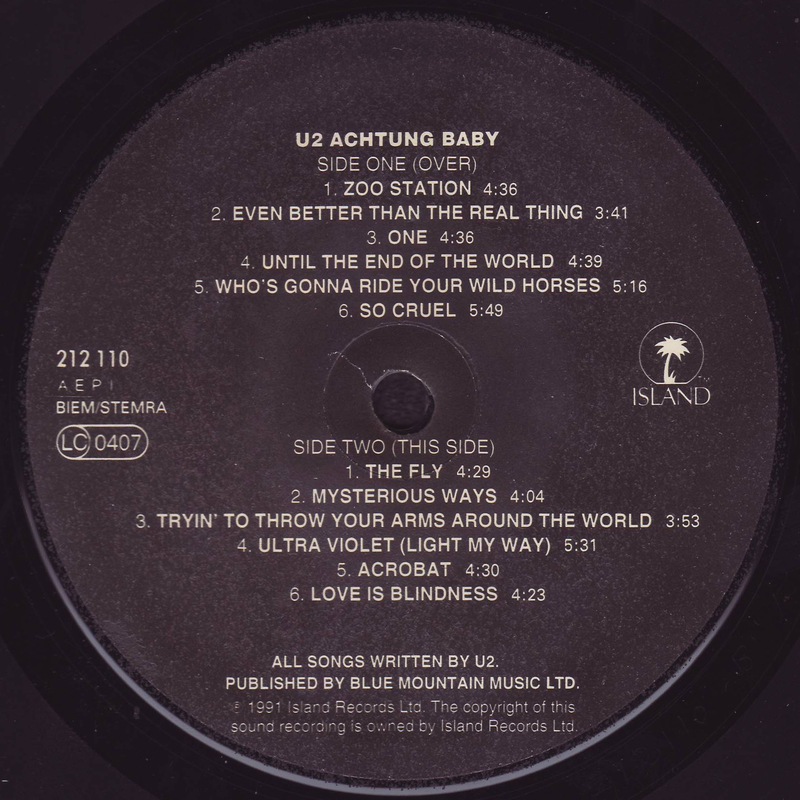 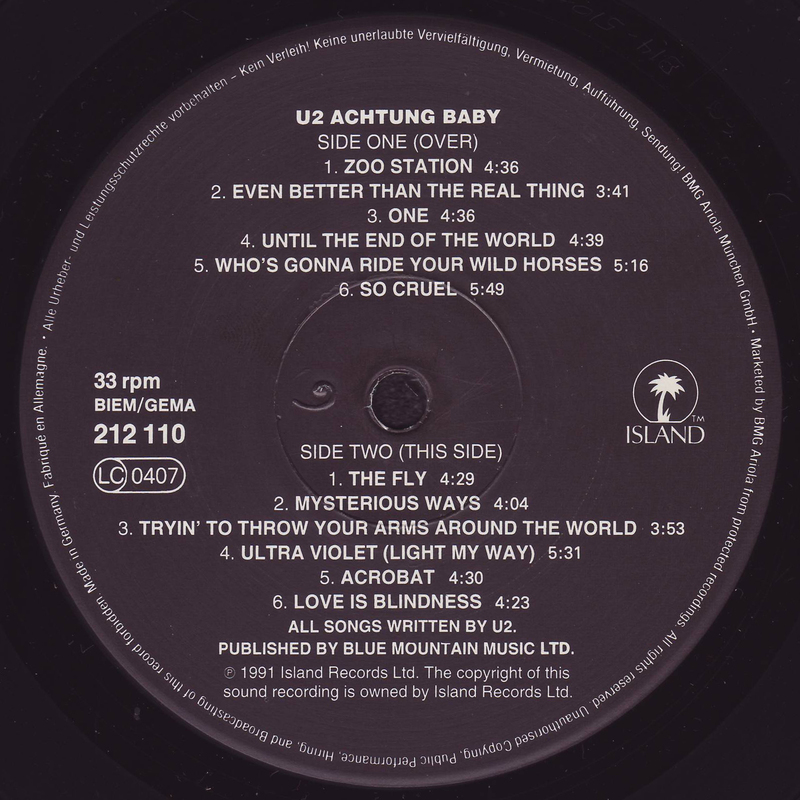 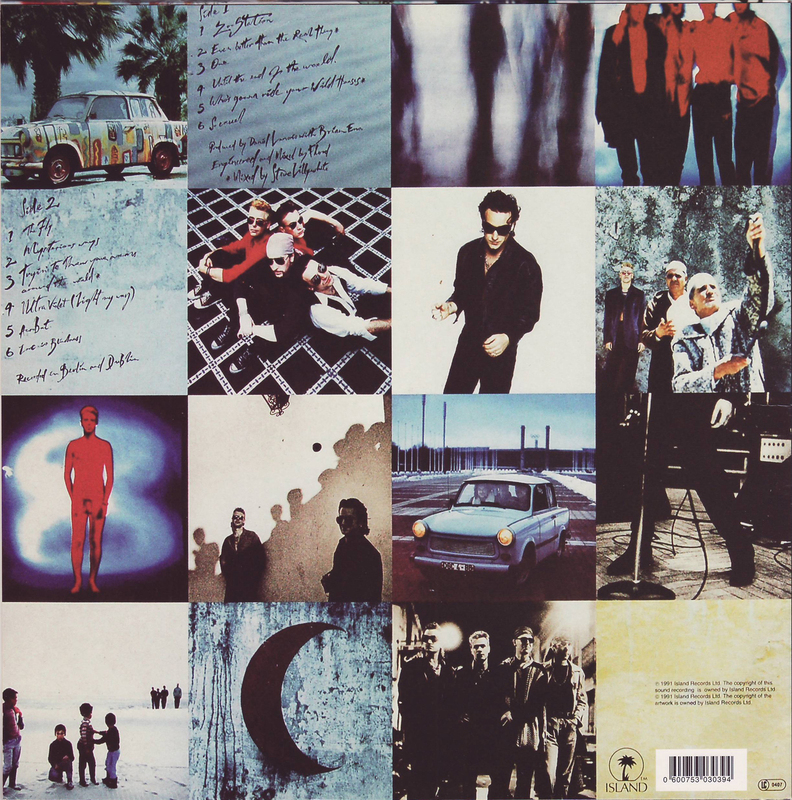 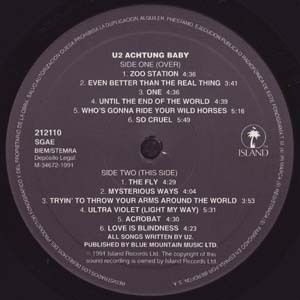 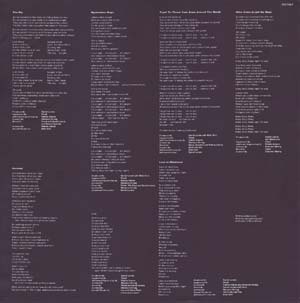 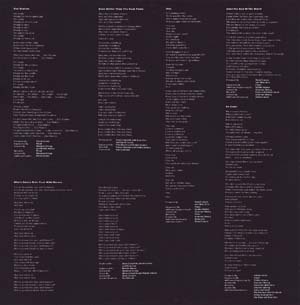 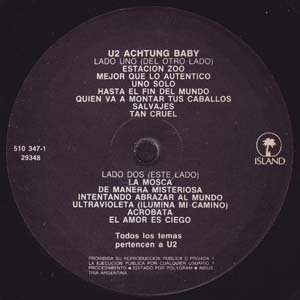 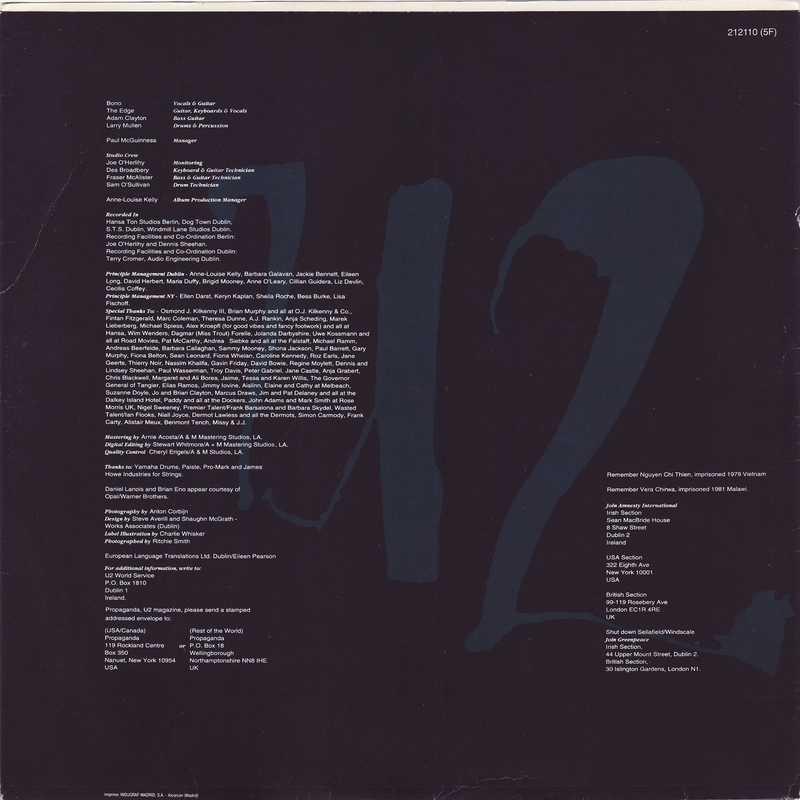 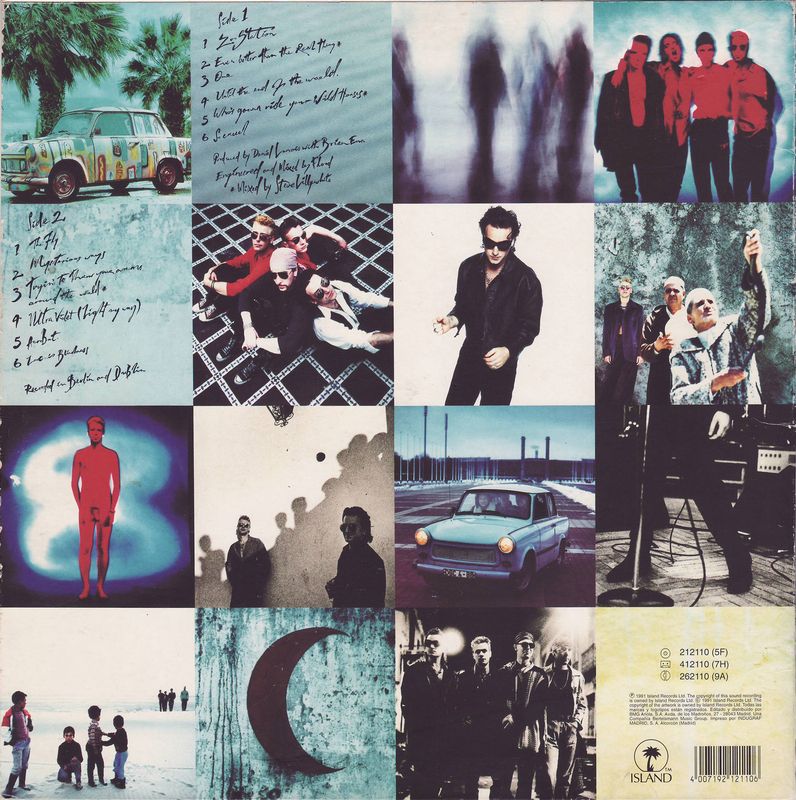 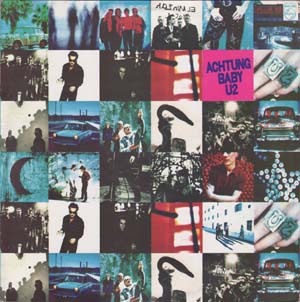 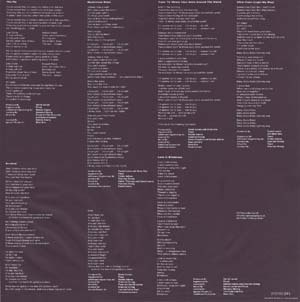 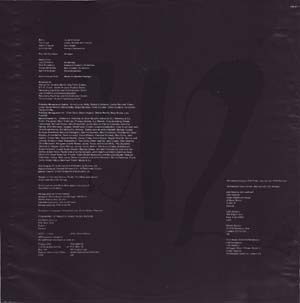 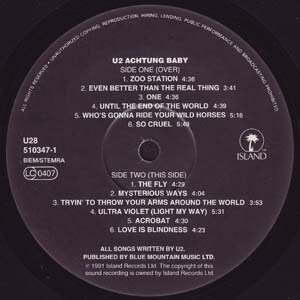 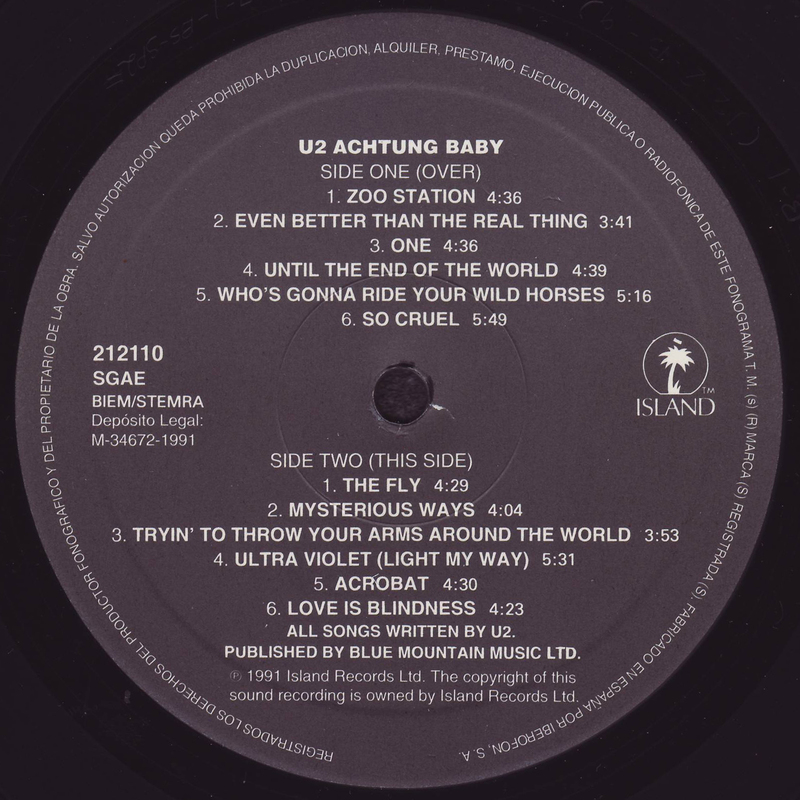 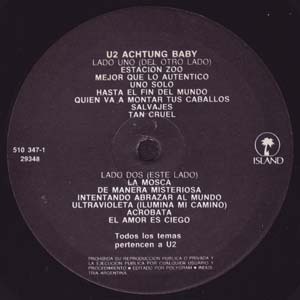 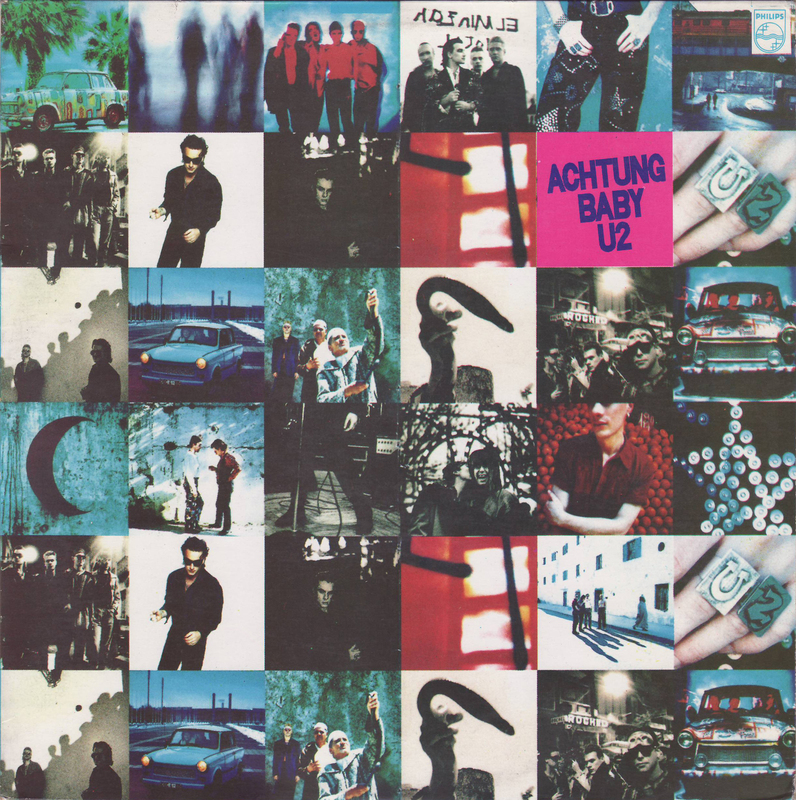 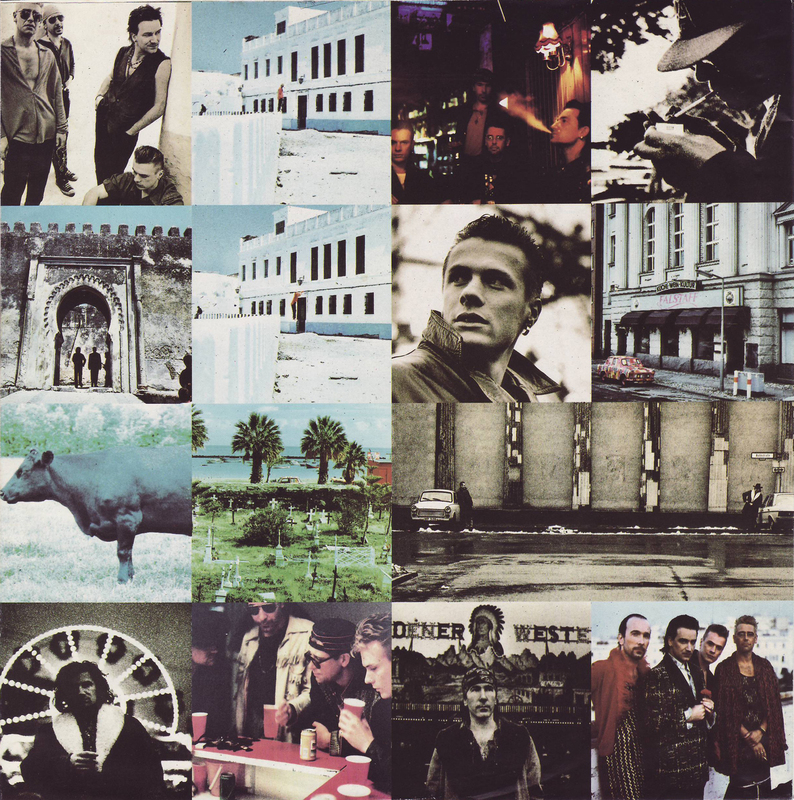 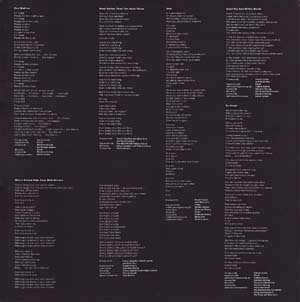 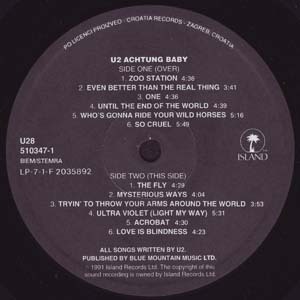 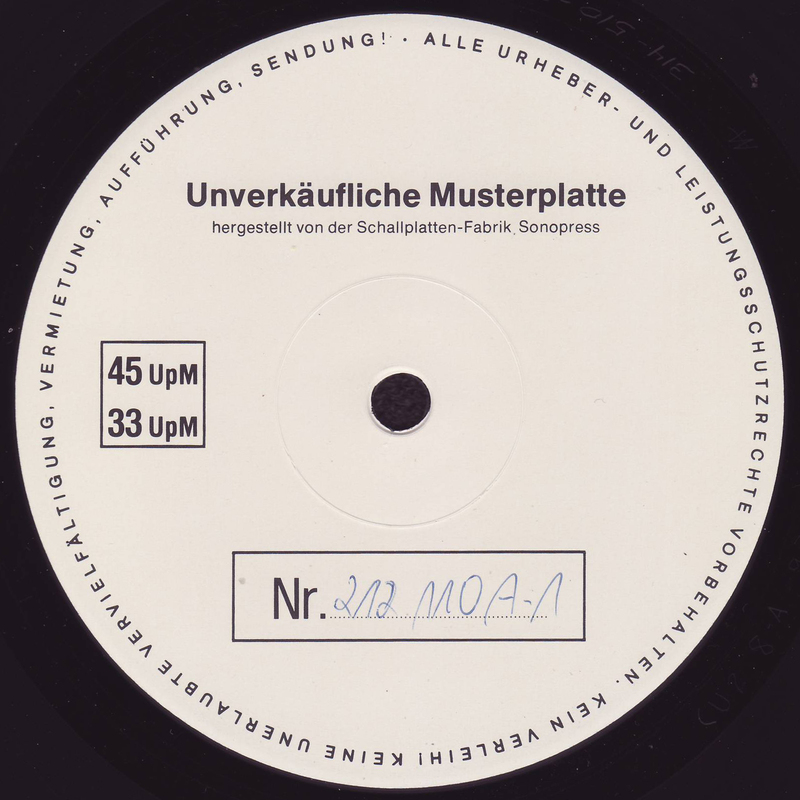 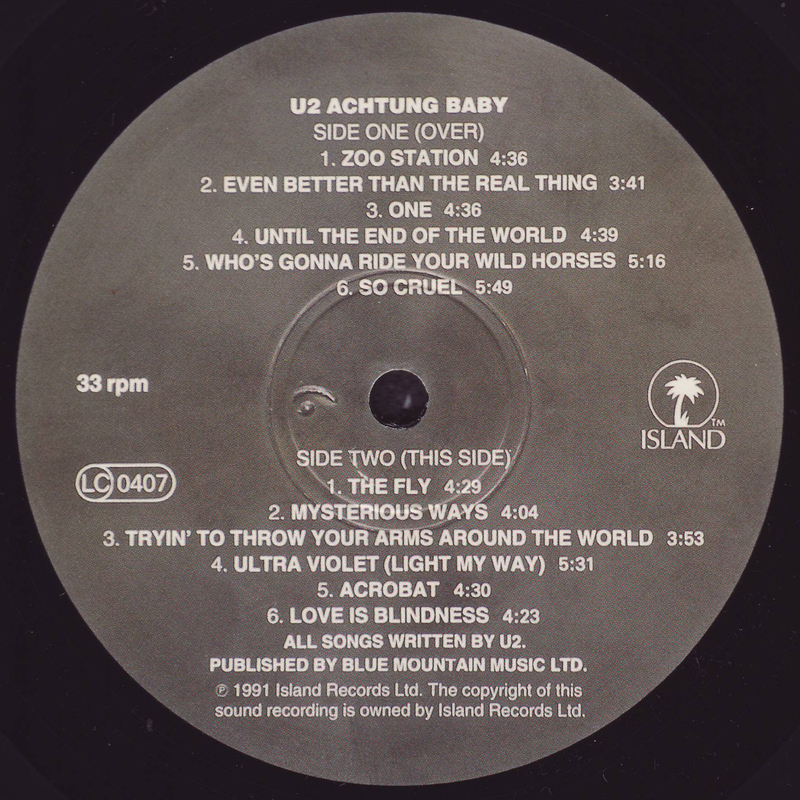 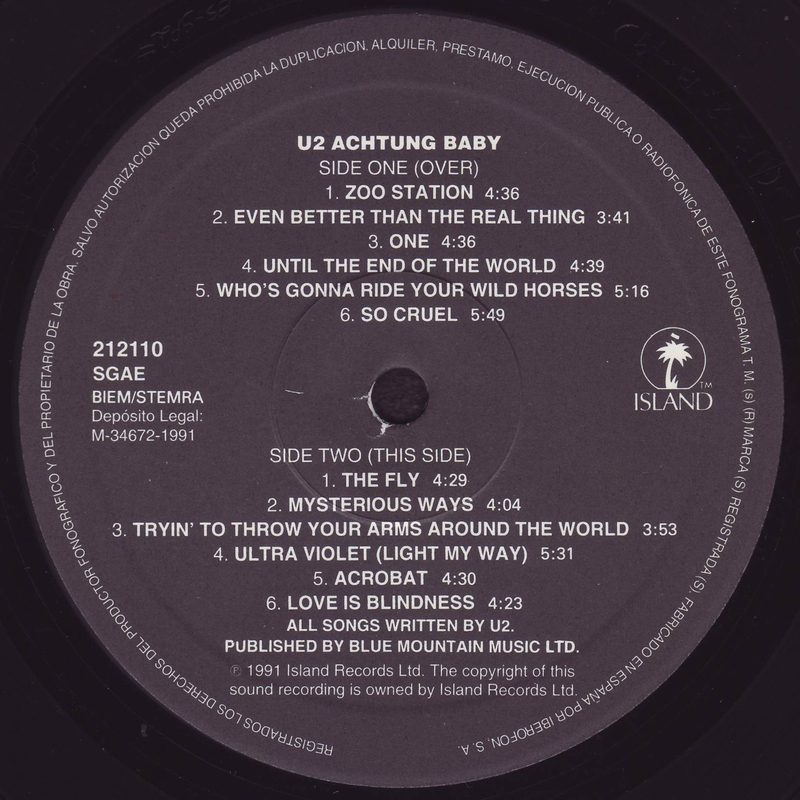 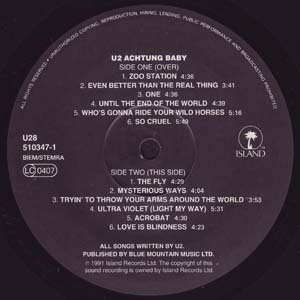 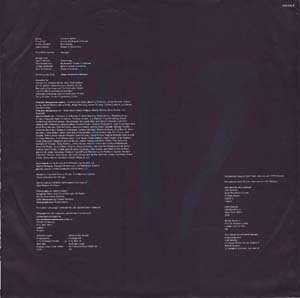 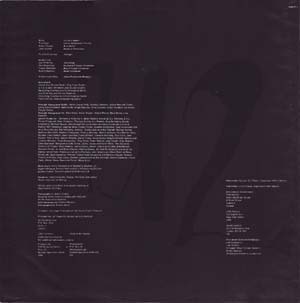 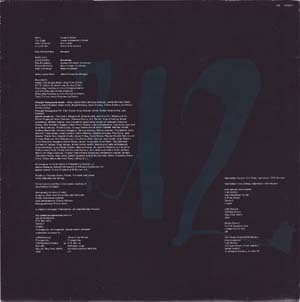 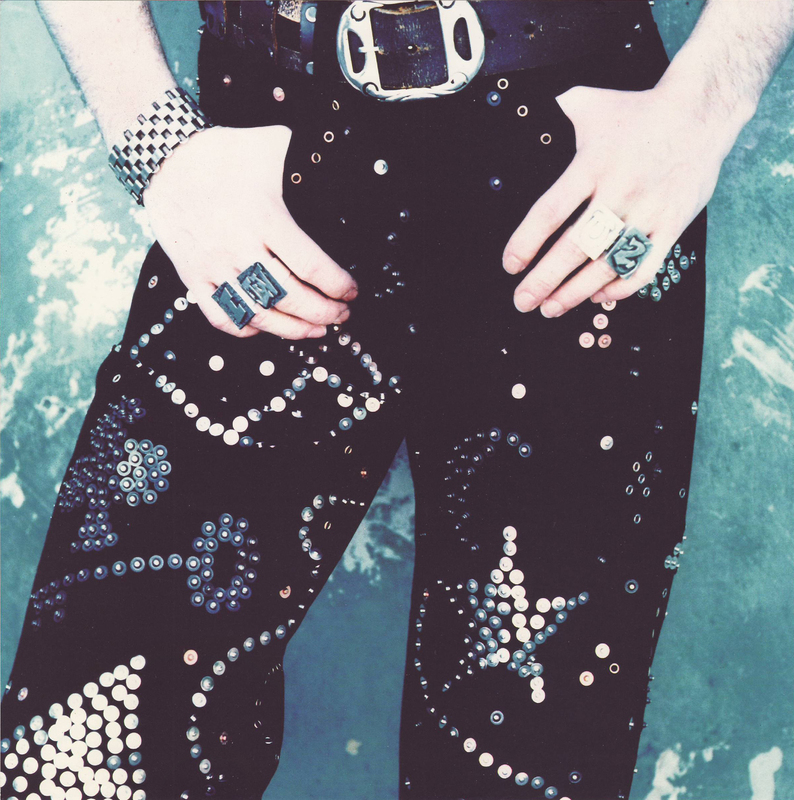 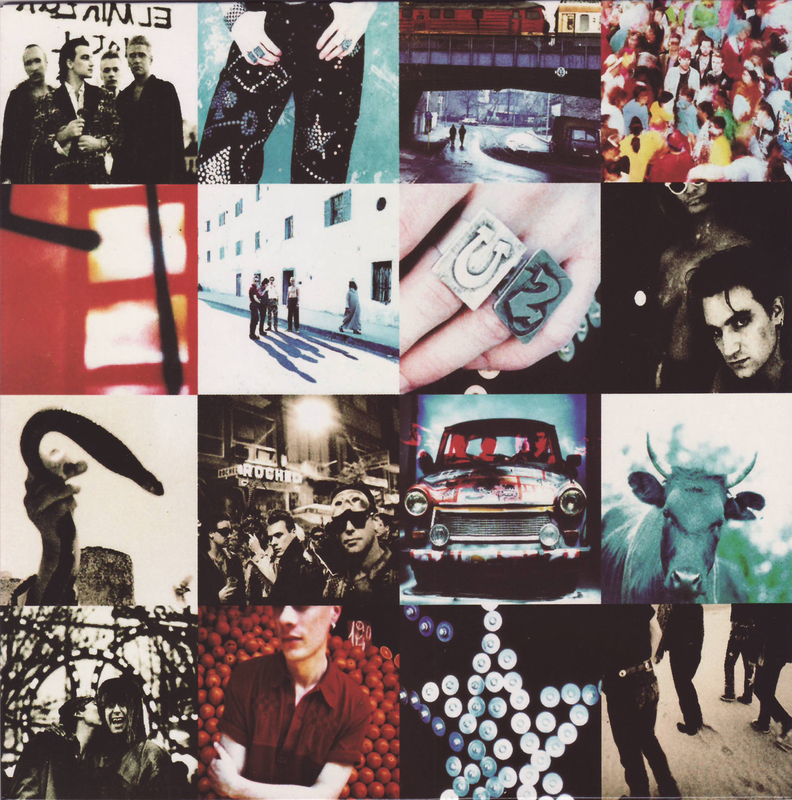 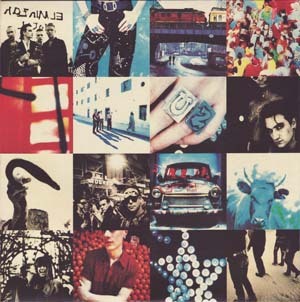 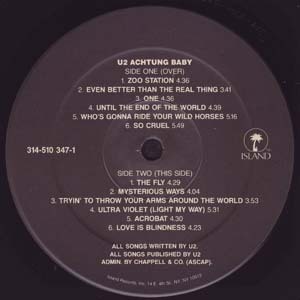 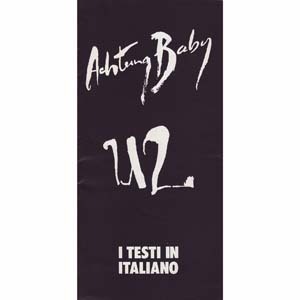 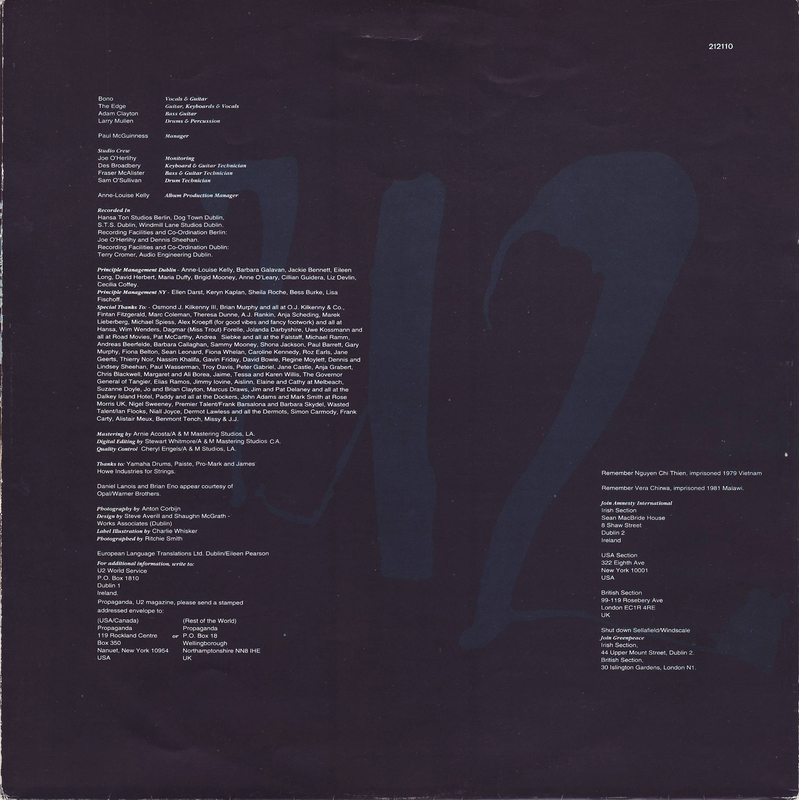 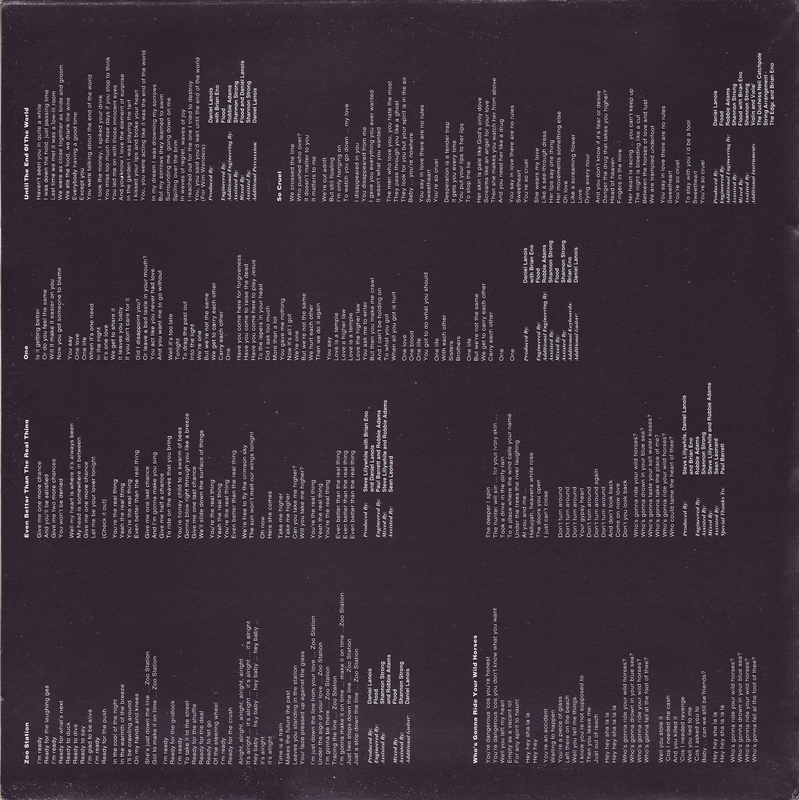 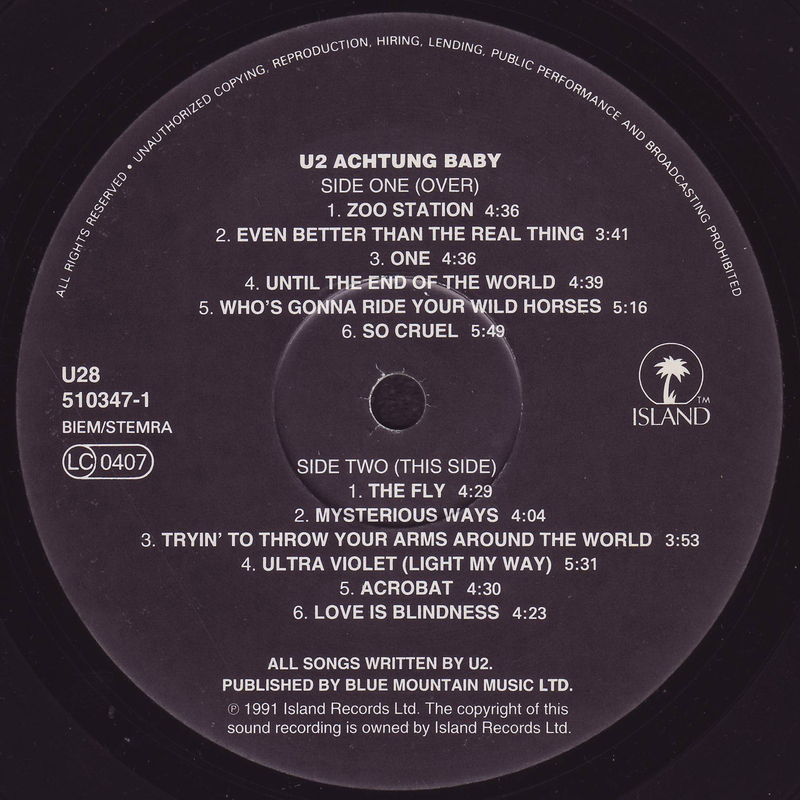 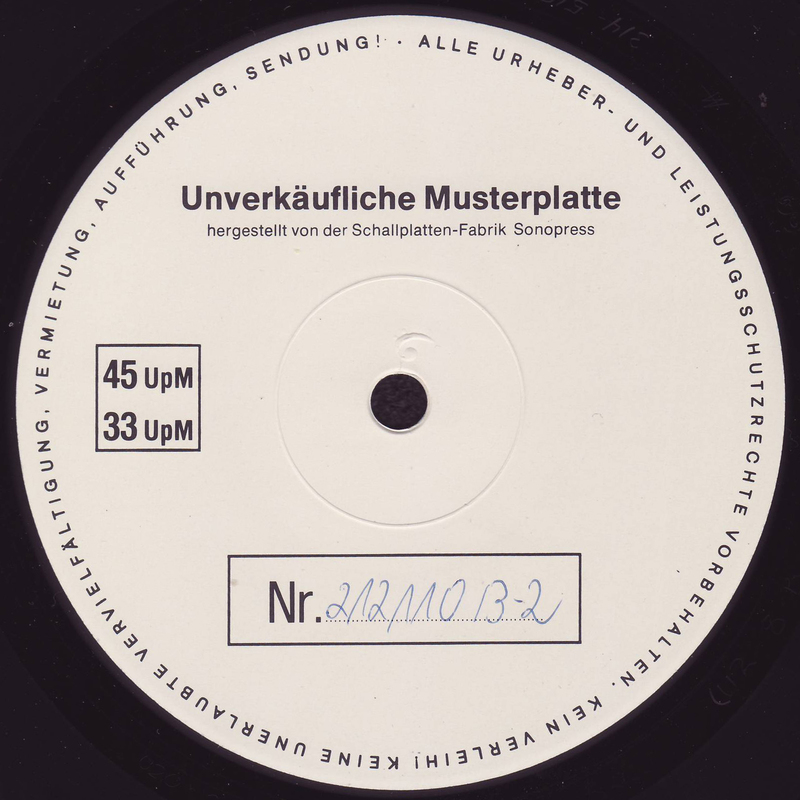 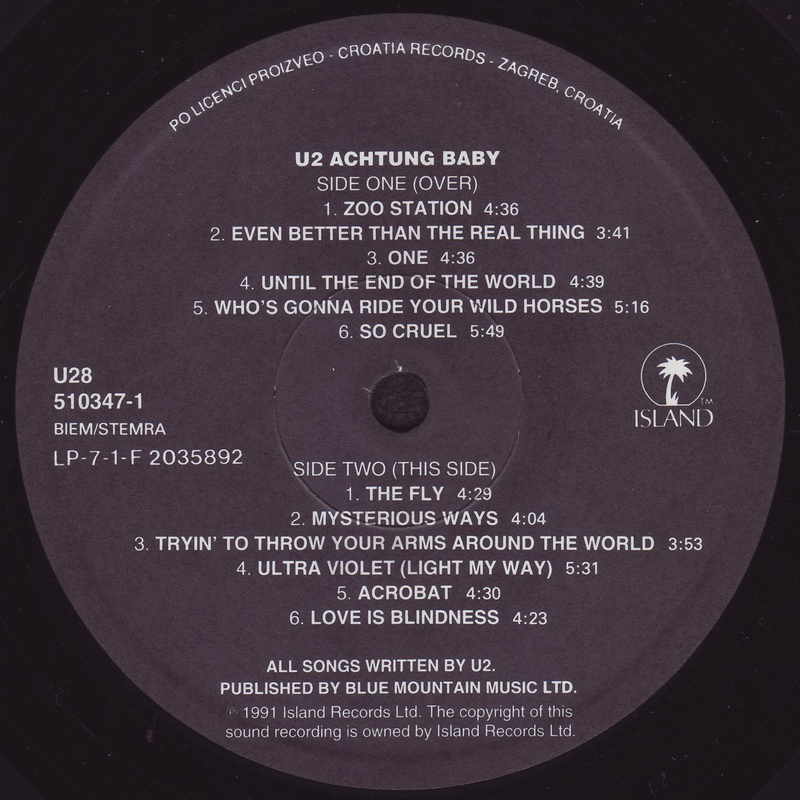 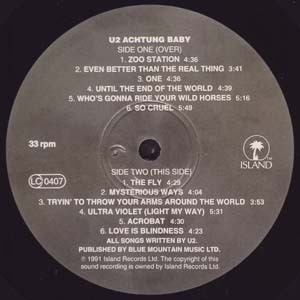 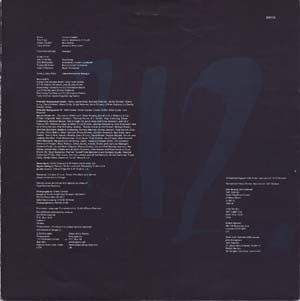 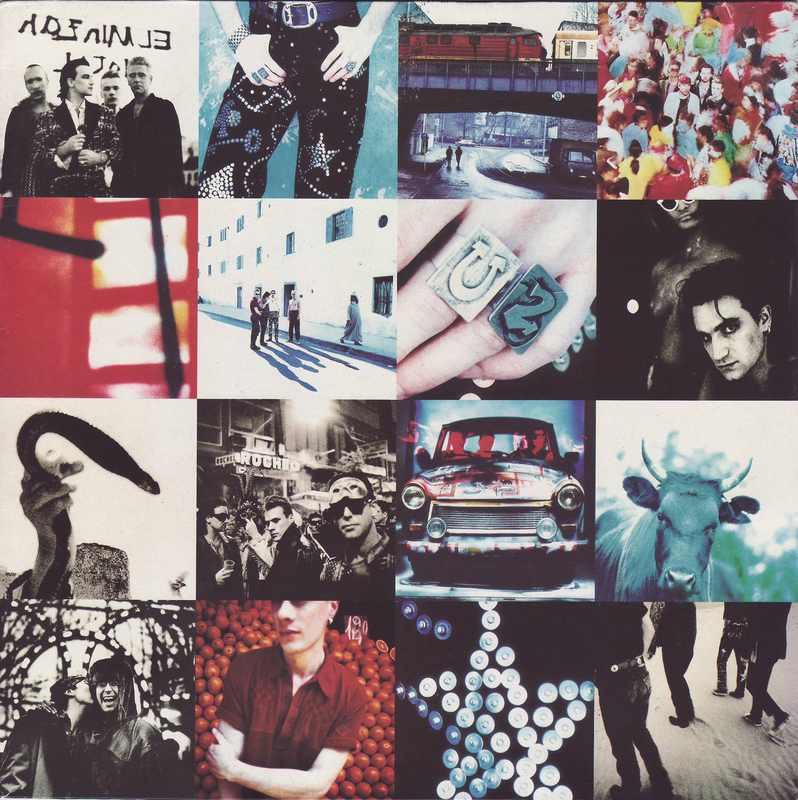 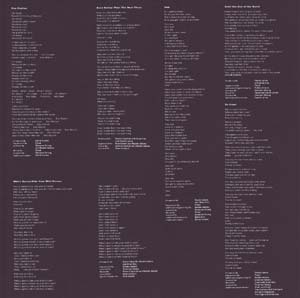 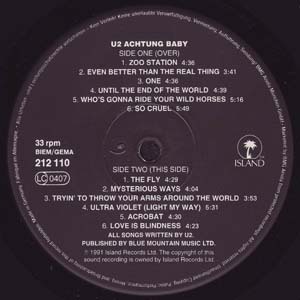 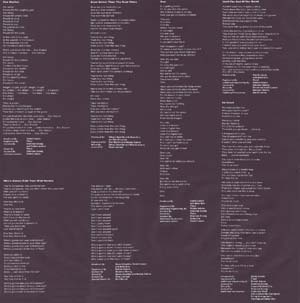 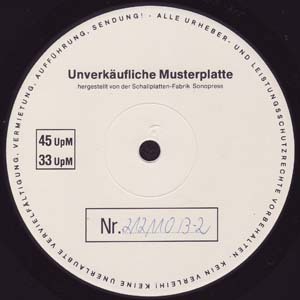 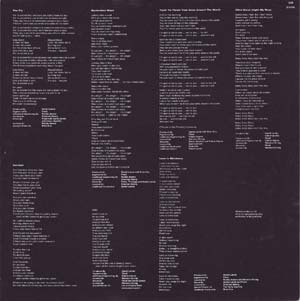 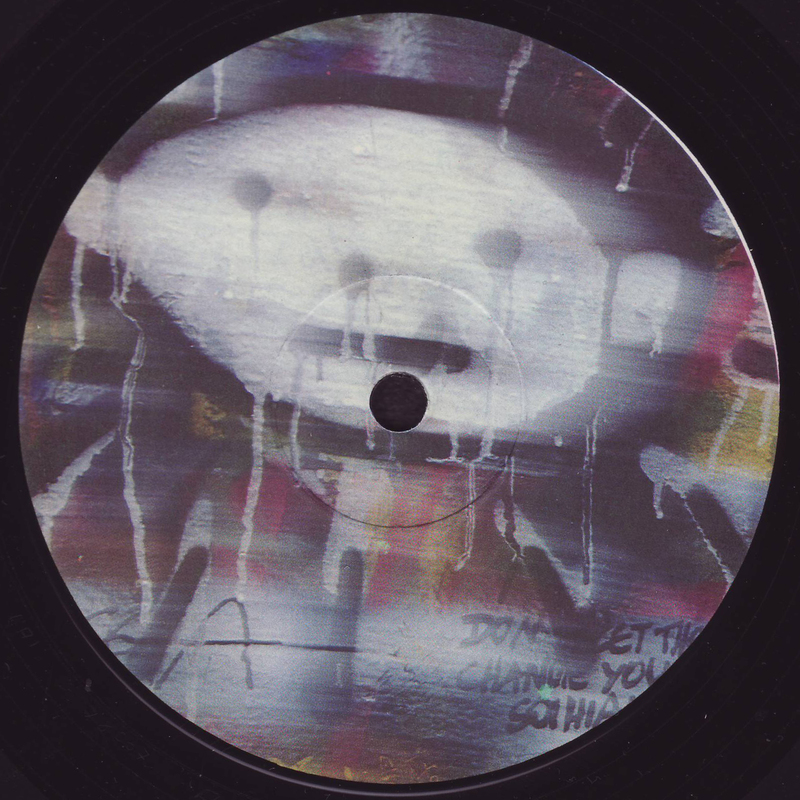 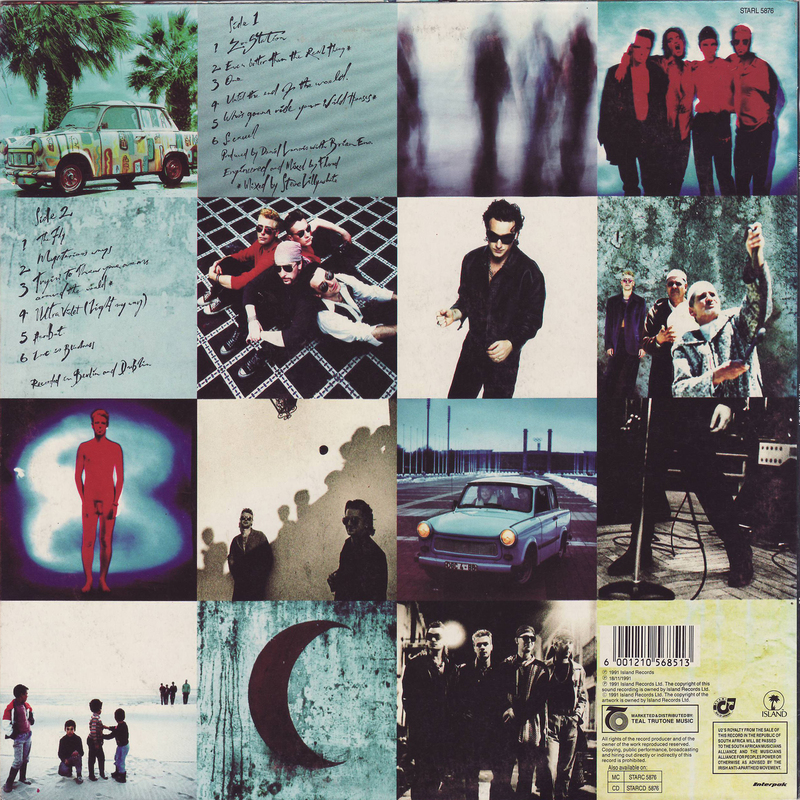 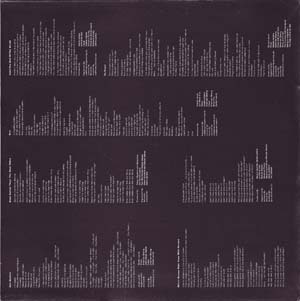 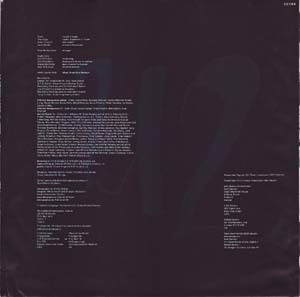 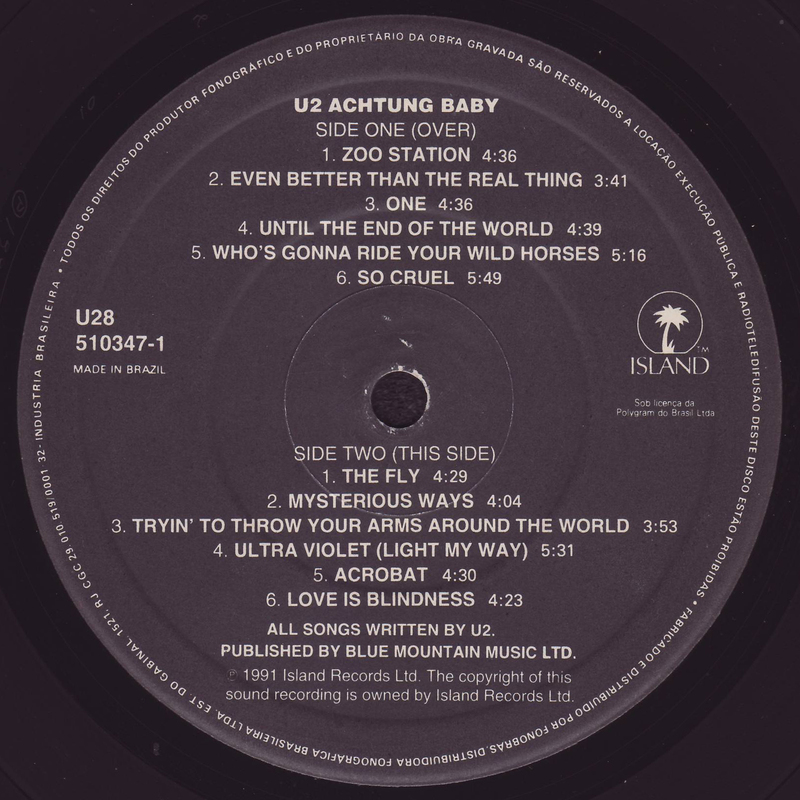 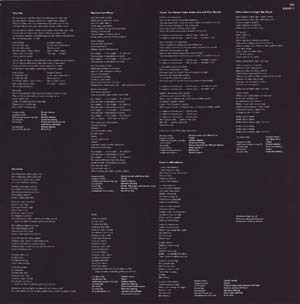 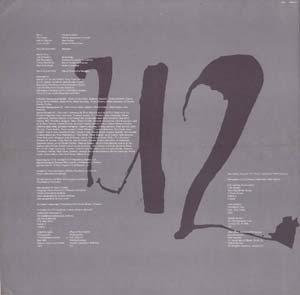 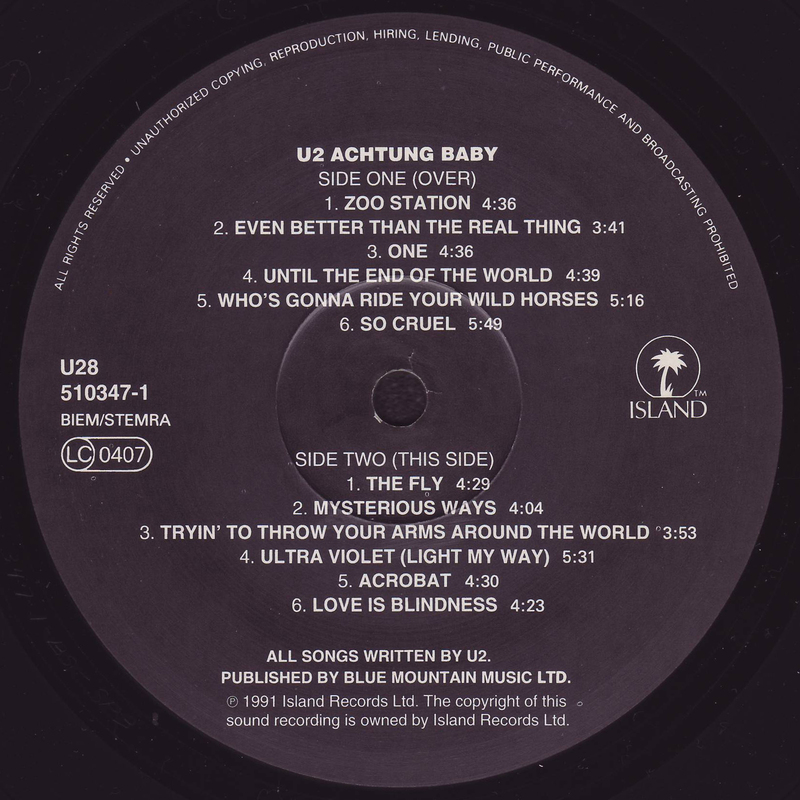 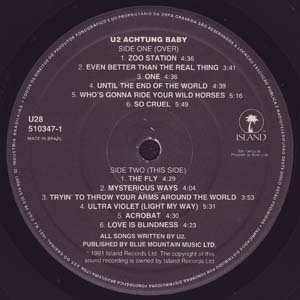 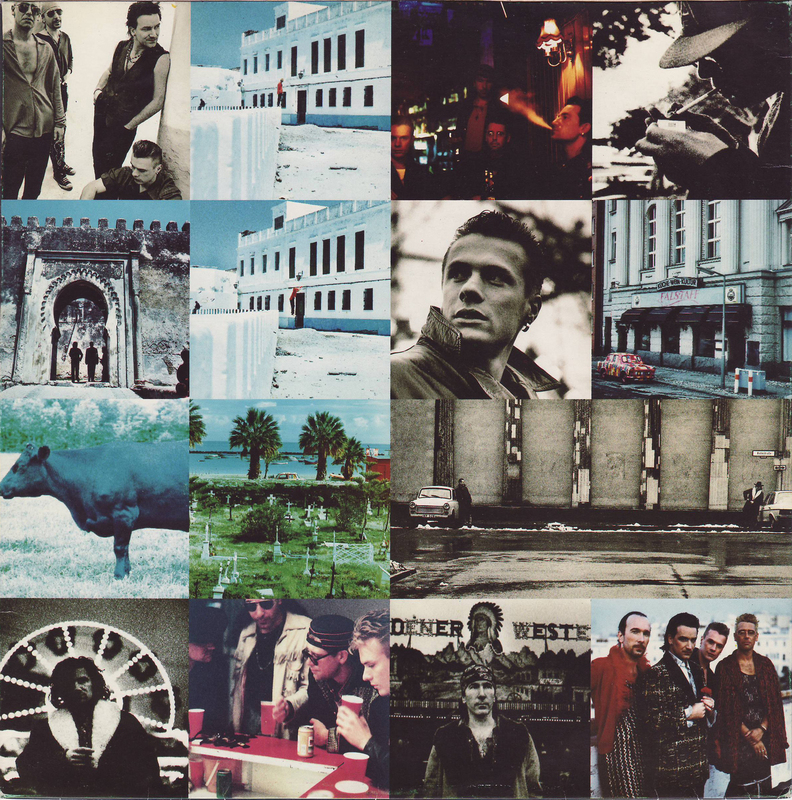 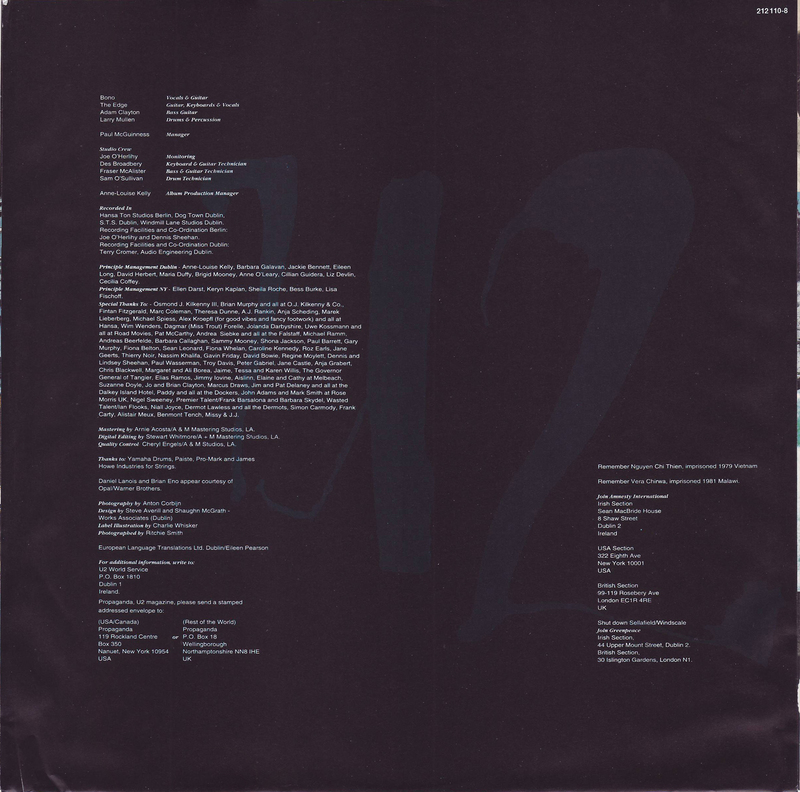 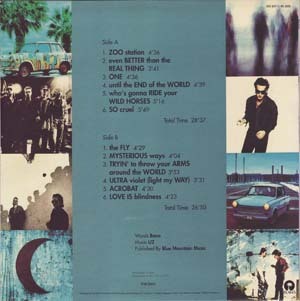 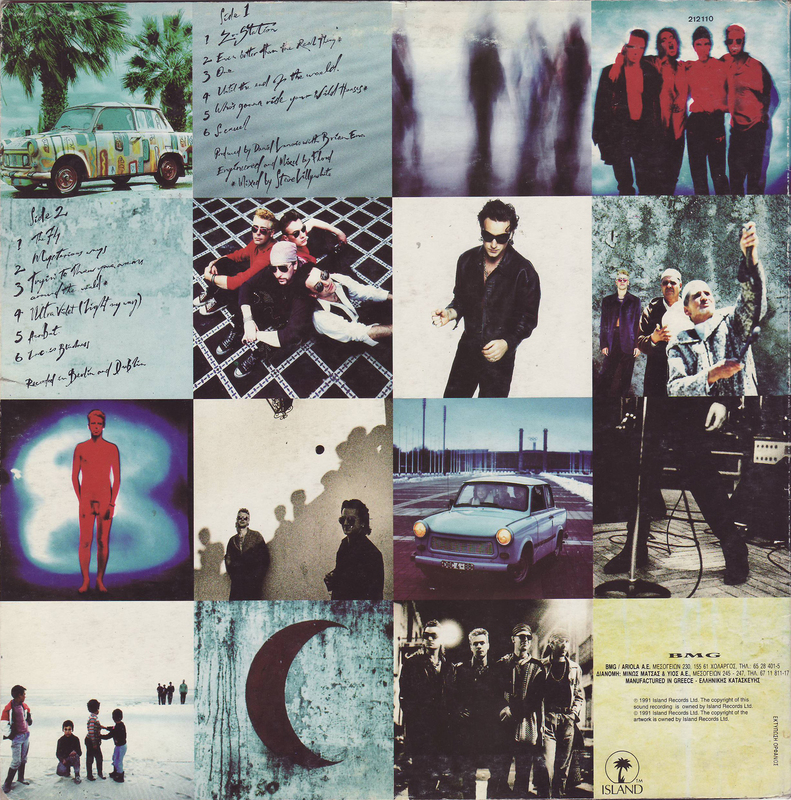 B-Matrix: "U2 8 A7 (U2 8-A-9) 1 314-510-347-1-AS-SP2"
A-Matrix: "U2 8-B-6 1 U2 8 B-2 AA"
1 of 16 12" posters given out with LP in week of release. 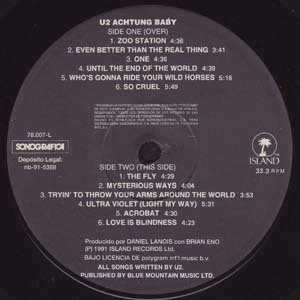 A-Matrix: "U28A7 (U2 8-A-9) 314-510-347-1-AS-SP2"
B-Matrix: "U28-B-6 (U2 8-B-10) 314-510-347-1-BS-SP3"
A-Matrix: "​(U2 8-A-10) 1 AA 314-510-347-1-AS-SP3 1-1"
B-Matrix: "(U2 8-B-9) 314-510-347-1-AS-SP2 AA 1-1​"
A-Matrix: "​(U2 8-A-10) AA 314-510-347-1-AS-SP3 1-1"
B-Matrix: "(U2 8-B-9) 314-510-347-1-BS-SP2# 1-1​"
A-Matrix: "(A) 78007.1 A 351-11​"
Front PS: with "U2 ACHTUNG BABY" title sticker, Sonografica "SELLO DE GARANTIA" sticker seal and Sonografica "DISCO PROMOCIONAL PROHIBIDA SU VENTA" sticker. 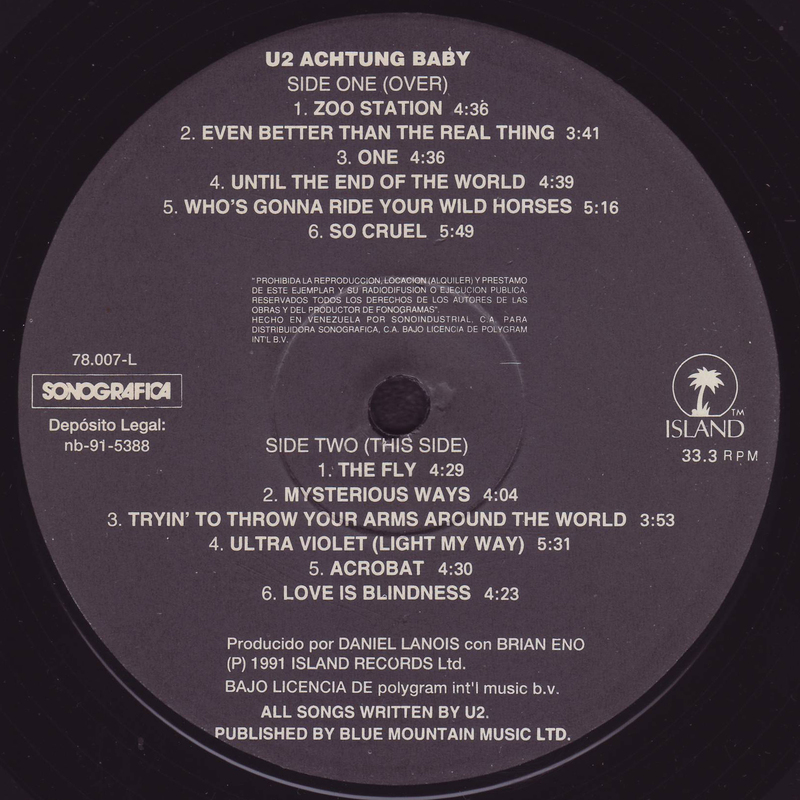 Back PS: with Sonografica "SELLO DE GARANTIA" sticker seal. 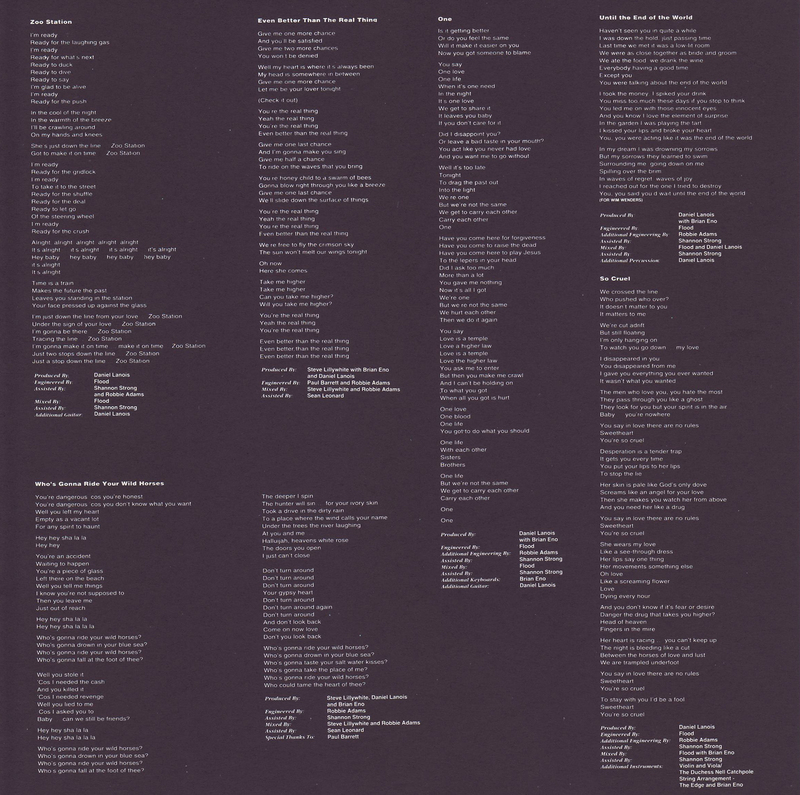 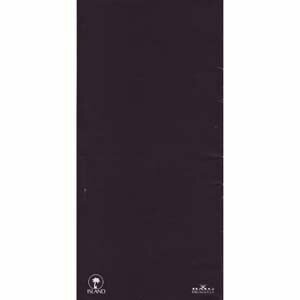 Page 1 of Insert: Double width insert folded in half. 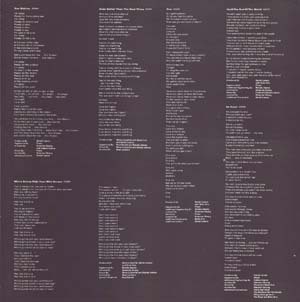 Page 2 of Insert: Double width insert folded in half. 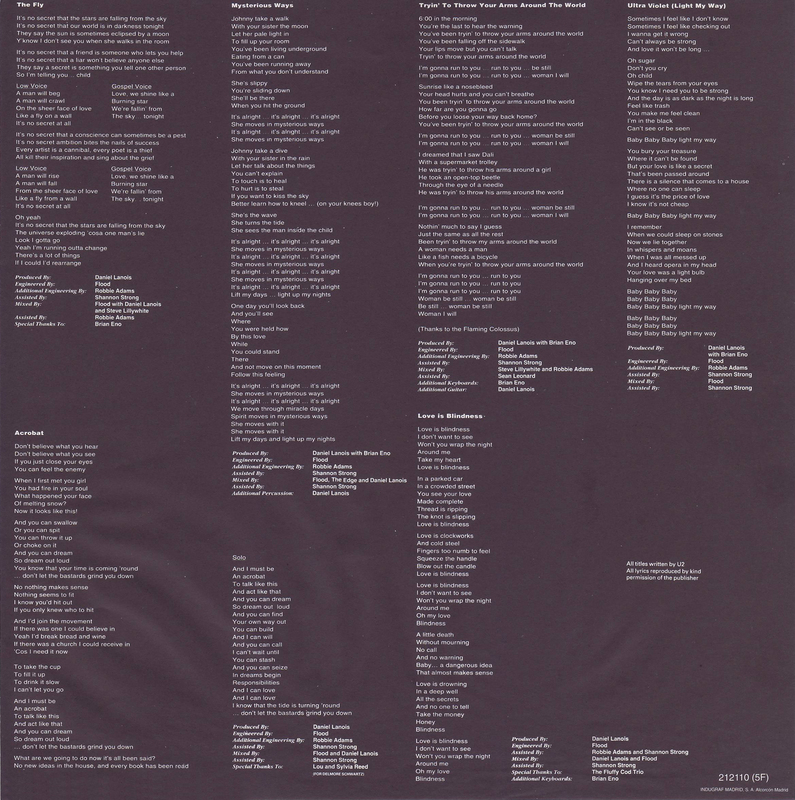 Page 3 of Insert: Double width insert folded in half. 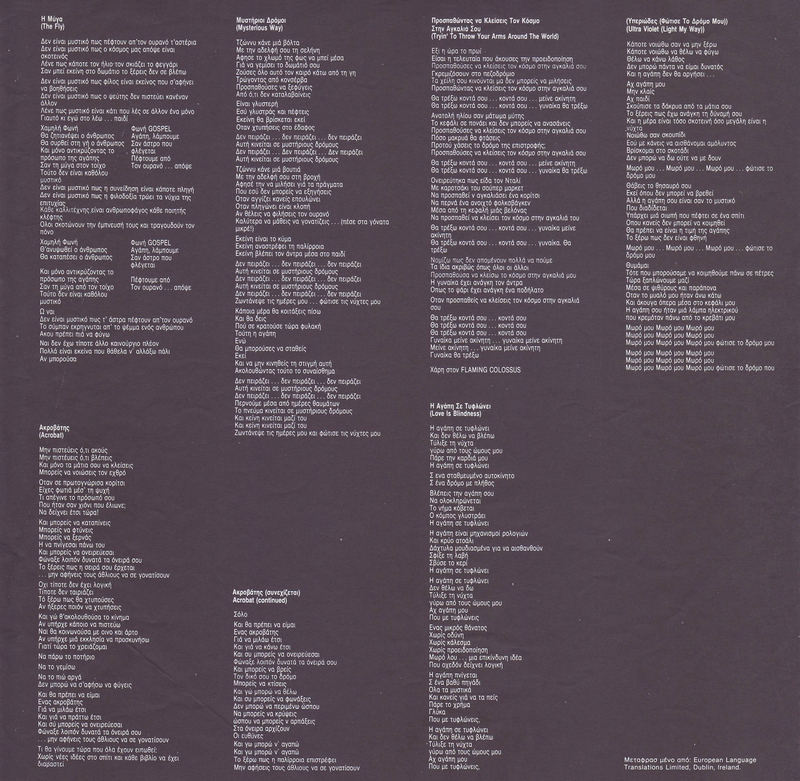 Page 4 of Insert: Double width insert folded in half. 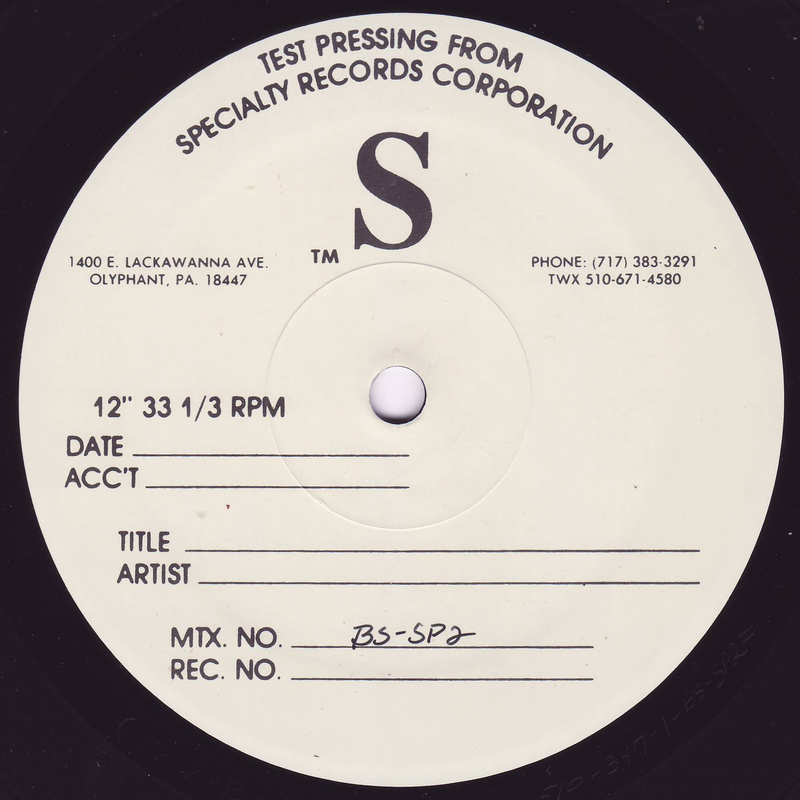 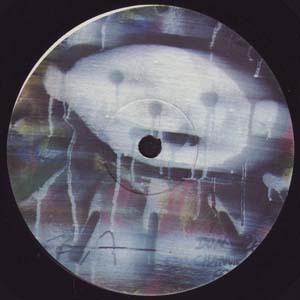 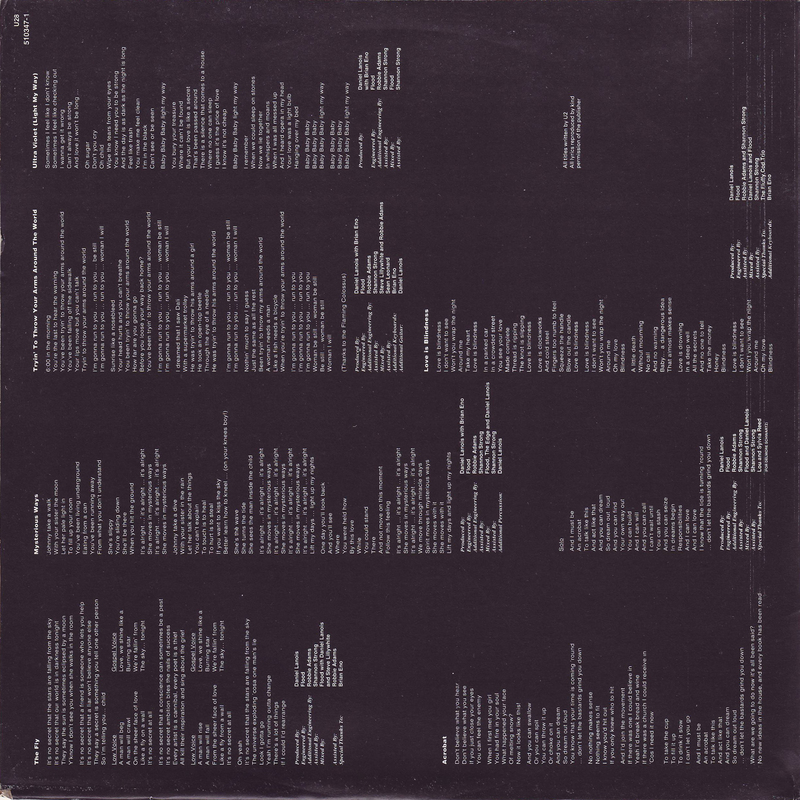 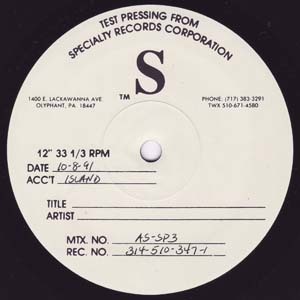 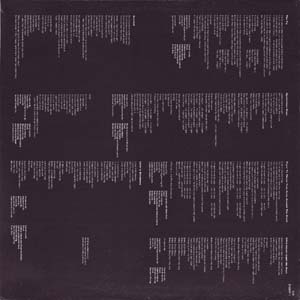 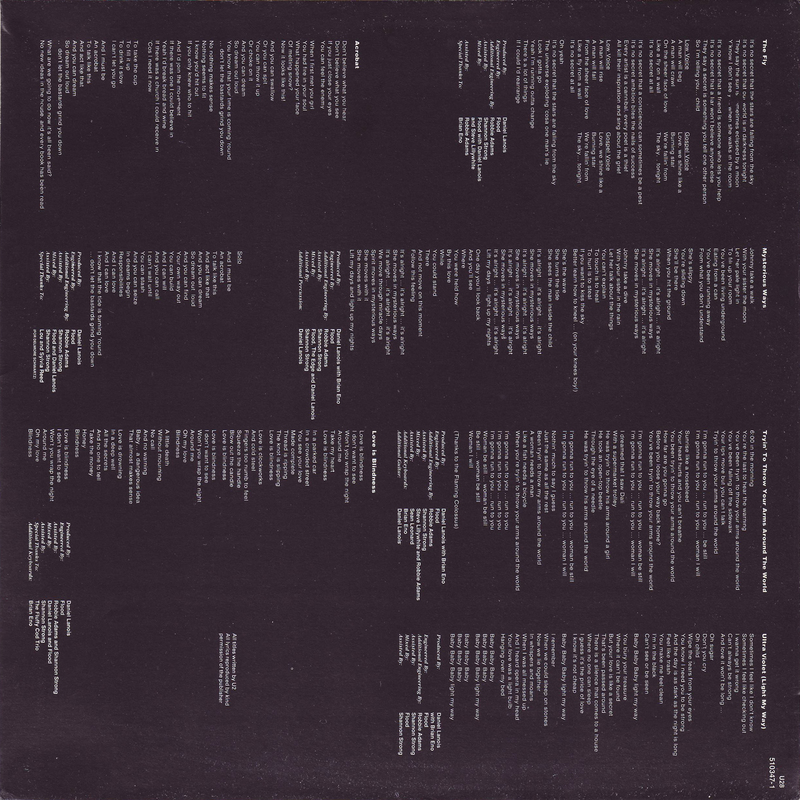 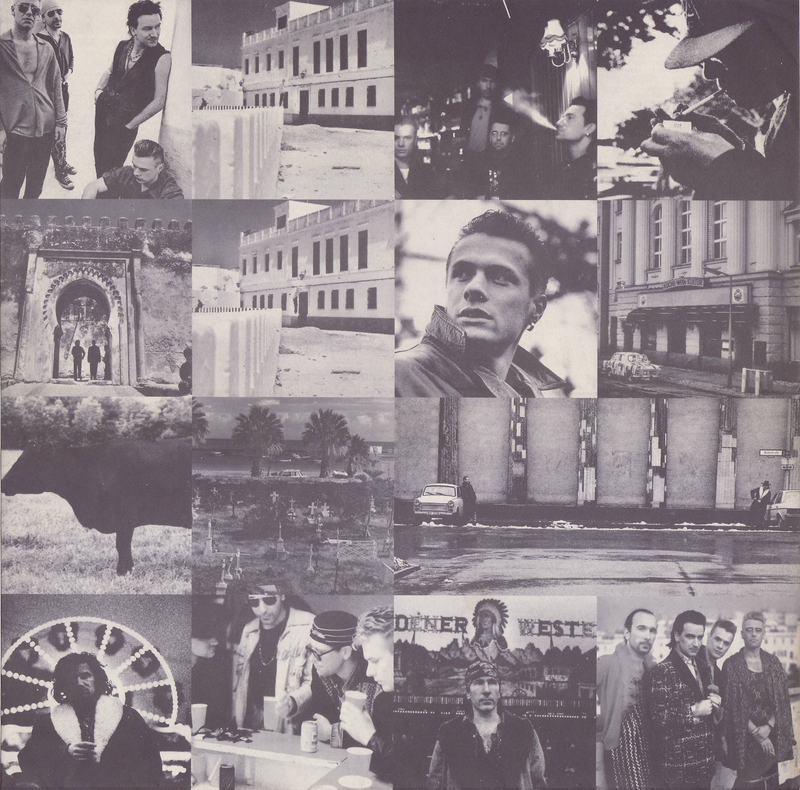 Back PS: Reproduction of South African sleeve with "1A Belmont Printers" and with stamp "MARKETED AND DISTRIBUTED BY ZIMBABWE MUSIC CORPORATION"